As in all my travels, it is the people who leave the most impression on me. 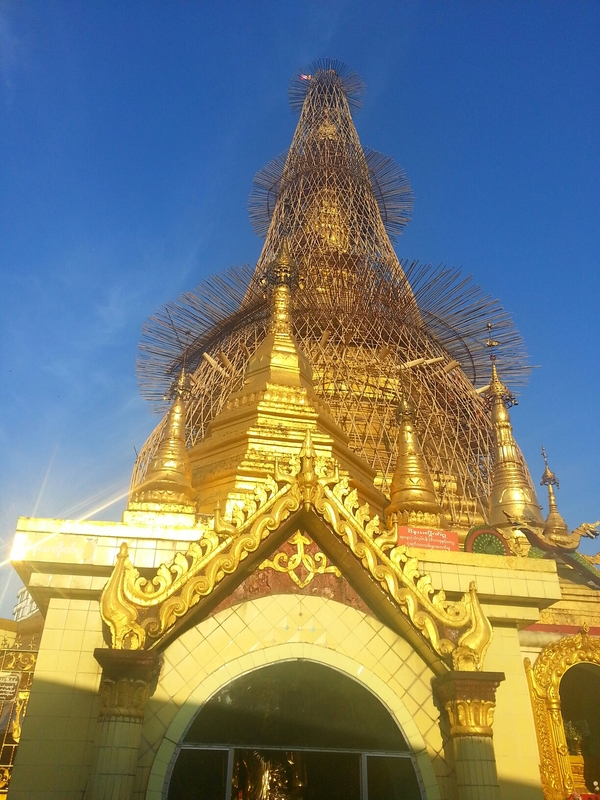 My first trip in Myanmar was December 2014. Elections had been announced and was scheduled in a few months. 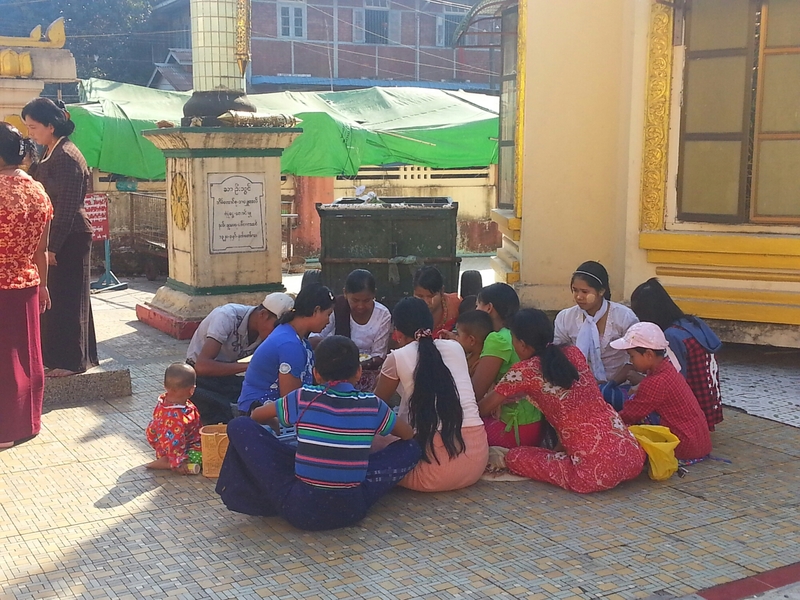 Everywhere I went and with the people I interacted with–trekking guides in Kalaw and Inle Lake, motorcycle drivers in Mandalay, and locals everywhere— on warming-up to conversations, talk would eventually turn to politics. Most knew Aquino was the Philippine president and they had deep regard for him and our country’s history of democratic struggle. The people I talked to were cautiously hopeful with the elections. 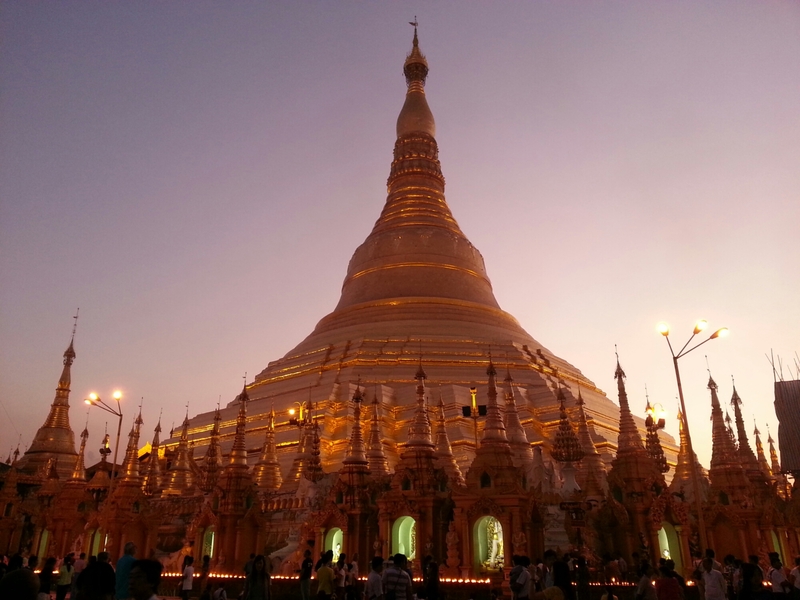 Myanmar was changing rapidly. Mobile phones and sim cards are now widely available and cheap (sim cards years ago were as much as USD500 and were raffled off), a Norwegian company, Telnor, was providing Internet connection, and people had Facebook. But the people were well aware of their history, particularly what the post-1998 election events. So they was an edge in their hopes. It is my fervent wish that it really does happen. Sure, the traffic can be quite maddening at times especially downtown but it doesn’t take more than a few hundred meters to find a quiet street. 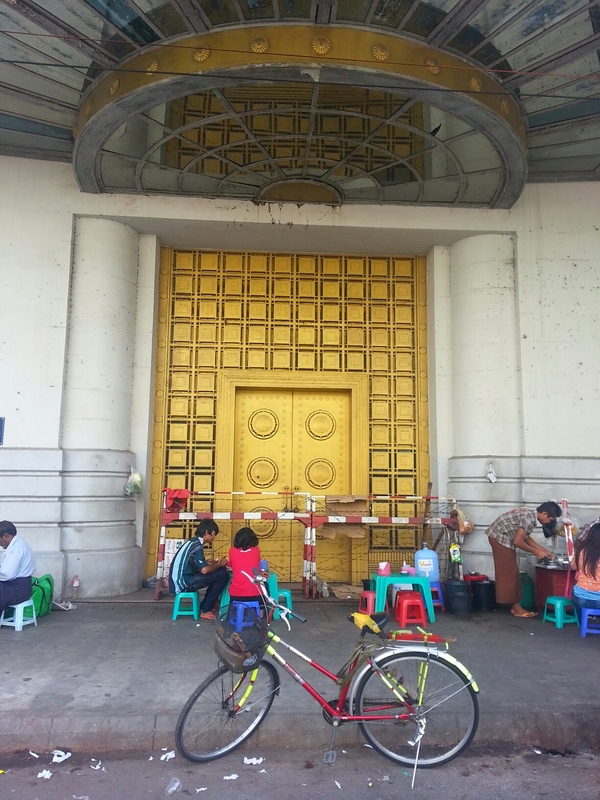 It’s a gentle city that still reeks of old Asia charm when life’s rhythms are punctuated by temples and markets. Aside from serving up a cuppa and more, tea houses are important social places where people gather to gossip, exchange news, or simply watch the world go by. It’s refreshing to be in a place where people actually mingle and talk to each other rather than staring at a tablet or a smart phone. 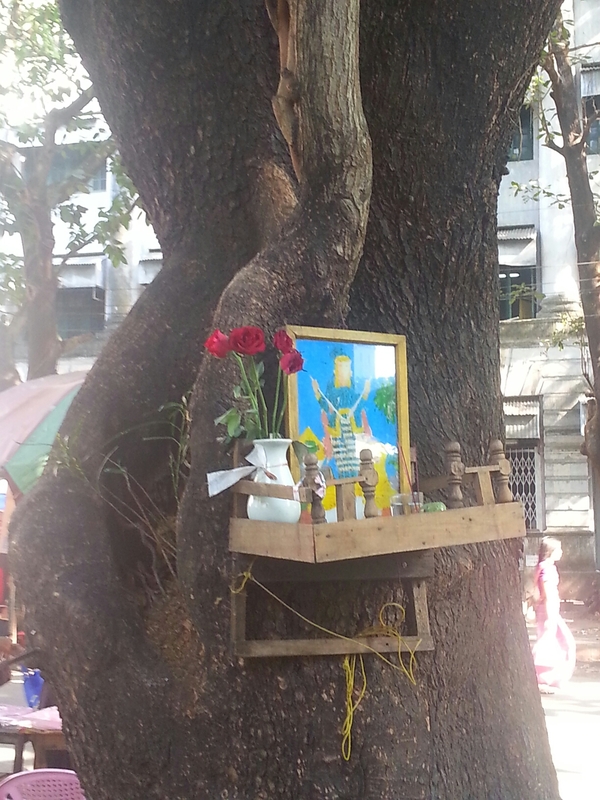 They’re everywhere—under a tree or in the shadow of a building. 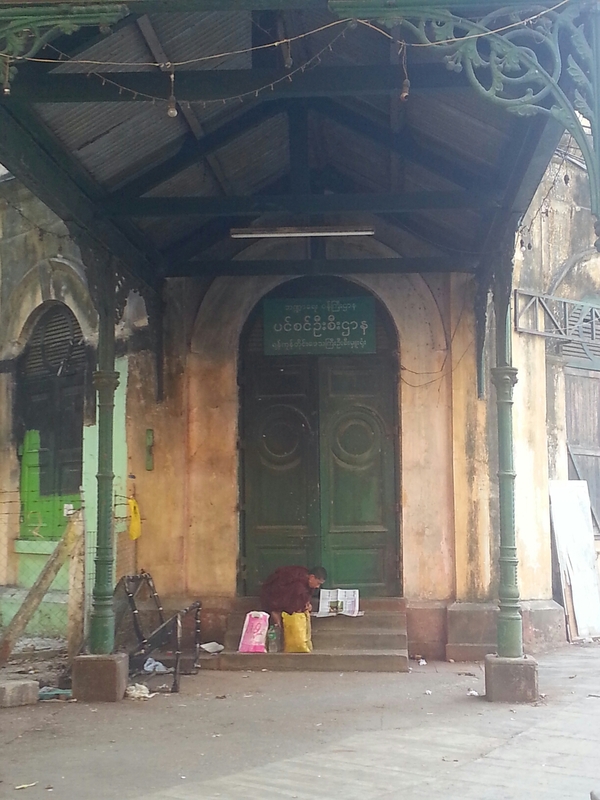 Mornings is the best time to come here, take a seat, and enjoy a bowl of mohingya and a cup of sweet tea with milk. 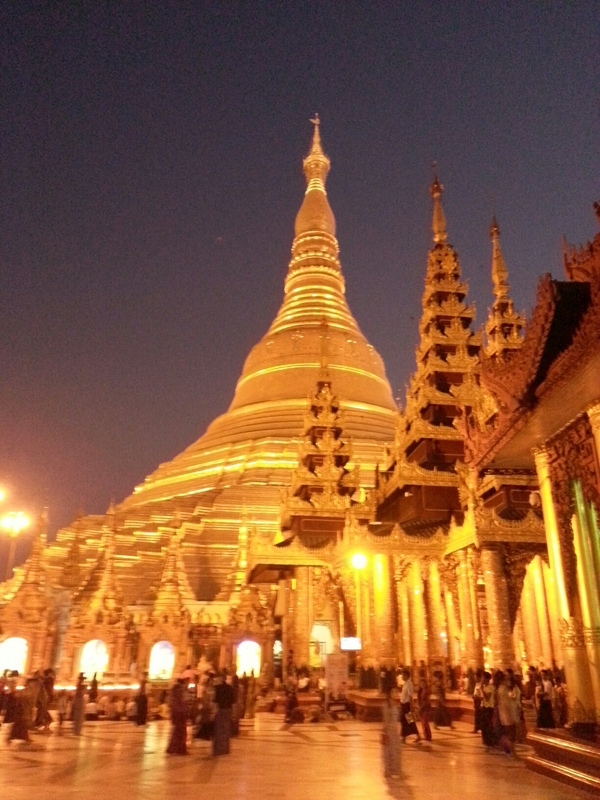 How can one not fall in love with this beautiful pagoda especially when lit-up at night. 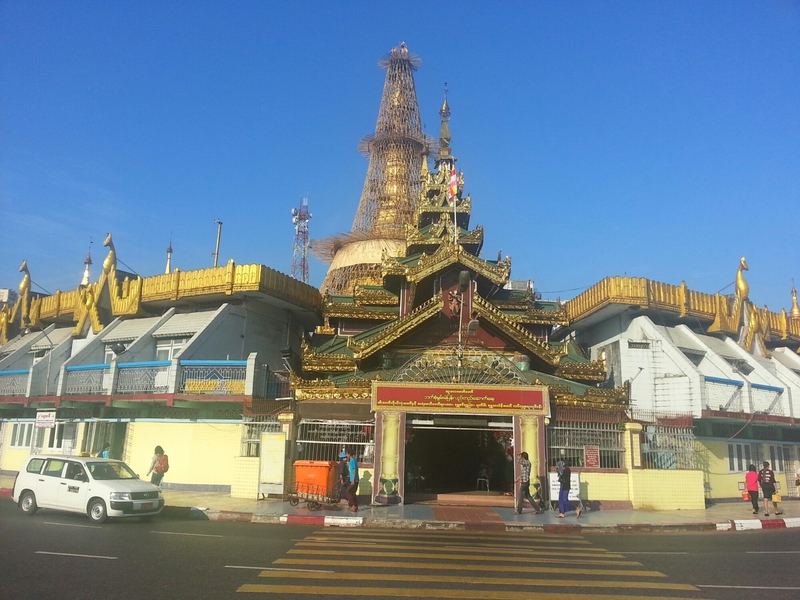 More than an architectural wonder, it is ground zero for the locals’ Buddhist faith. 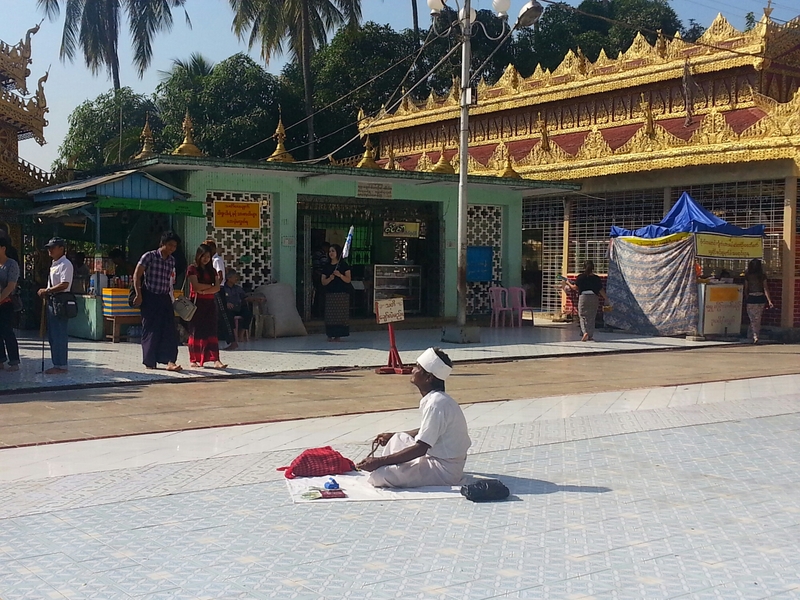 Yangon’s two other temples, Botataung by the river and Sule at the center are beautiful too. 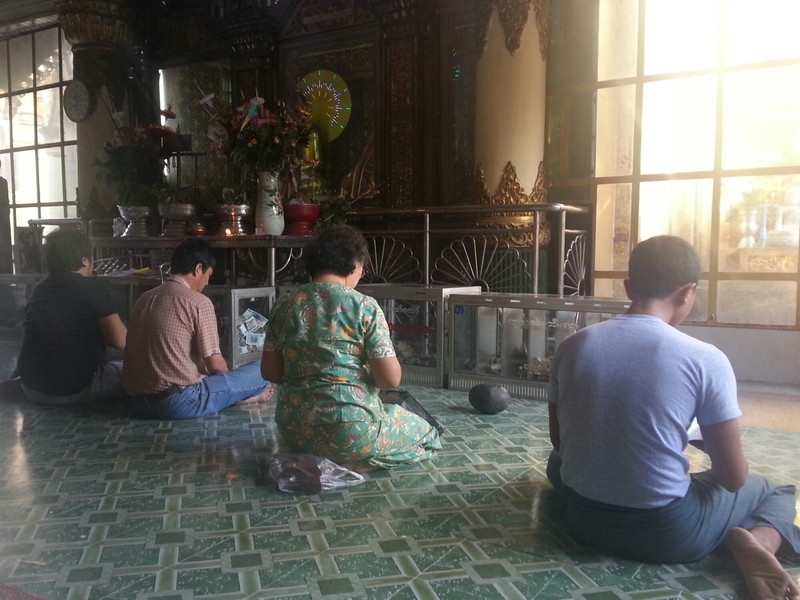 I am in complete awe by the fervor by which the people practice their faith in these temples. From solitary meditation to group chants. 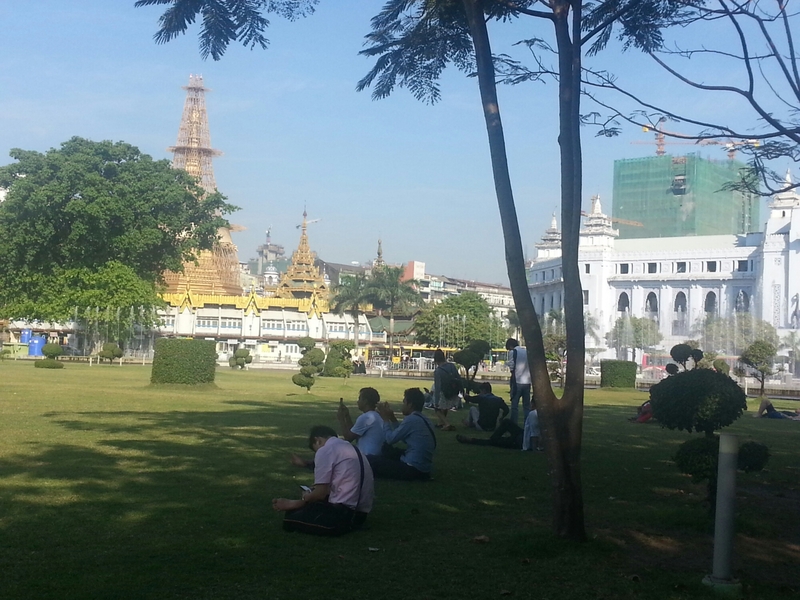 With their spacious grounds, especially Botataung’s the temples also function as mini-parks for families and couples. 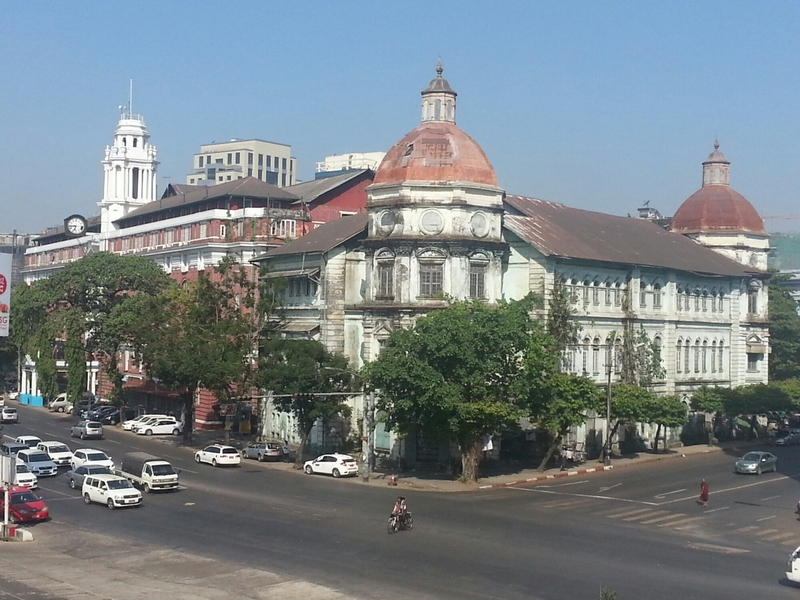 Yangon has the best preserved colonial cityscape in Southeast Asia. You can take the walking tour in Lonely Planet and detour in a few streets to see other architectural marvels outside the guidebook’s radar. 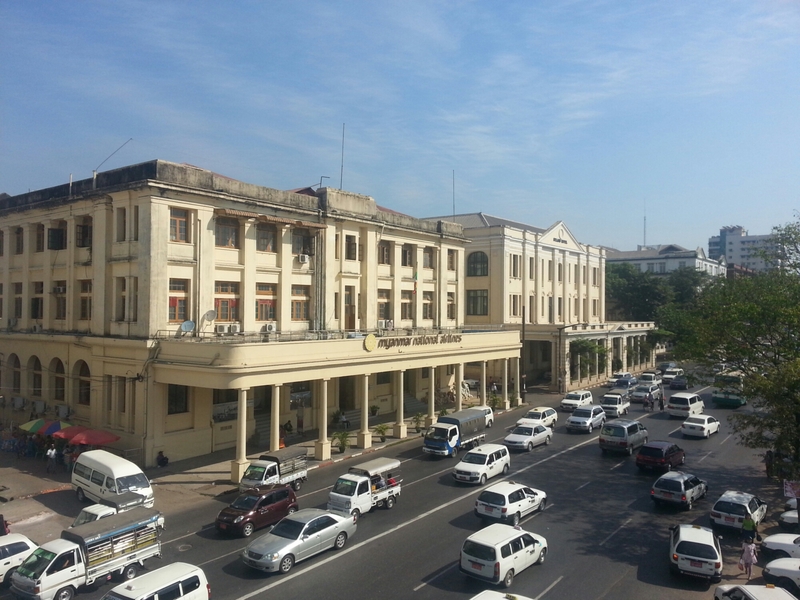 While others have been put to adaptive use. Go ahead, take a peek inside. 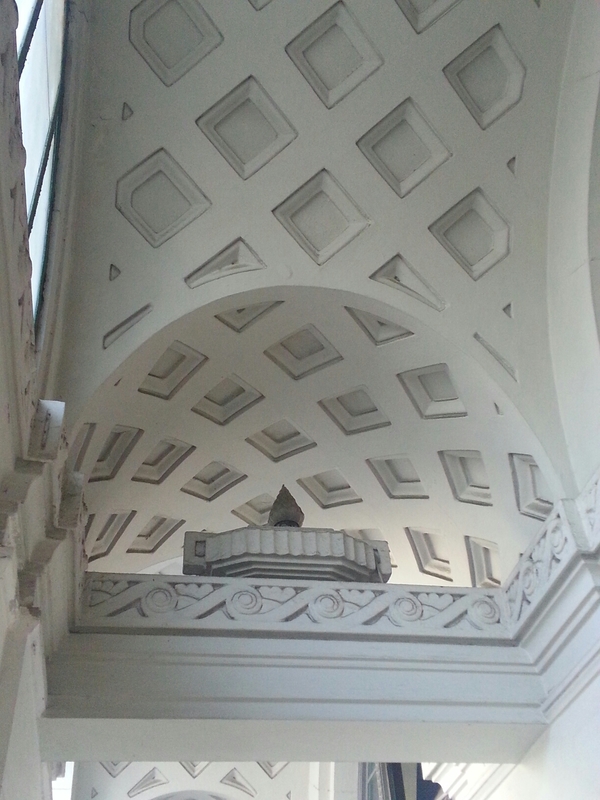 Always remember to gaze-up and see beautiful architectural details. 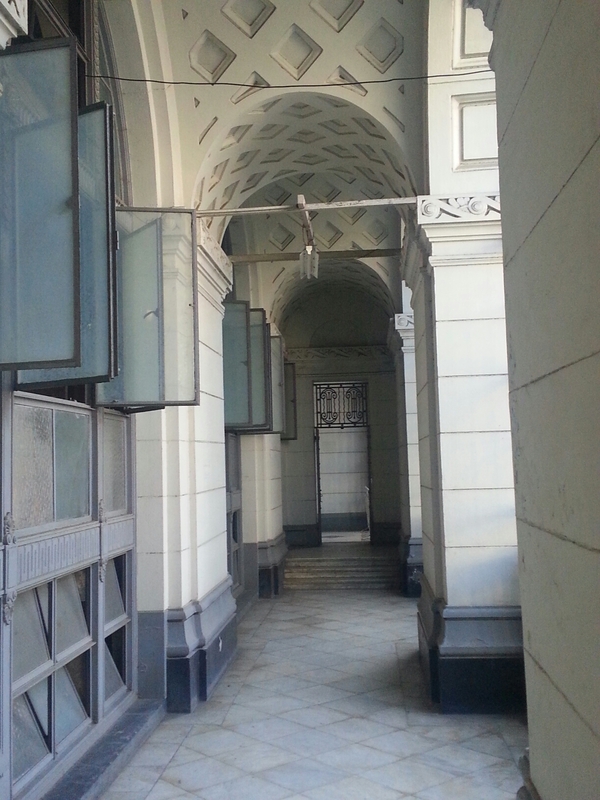 Wherever you go, down an alley or a street, you’ll find your own architectural wonder. It’s easy to flag-down a taxi anywhere and anytime. The usual rate is 2, 000 k. Some will ask for 2, 500 or 3, 000. Just flag-down another one. Most taxi drivers are really nice. They follow the usual 2, 000k rate and if they can speak English, engage you in conversation. A taxi from downtown to airport costs 6, 000-8, 000 k. I left at 8am and took less than an hour, traffic included. 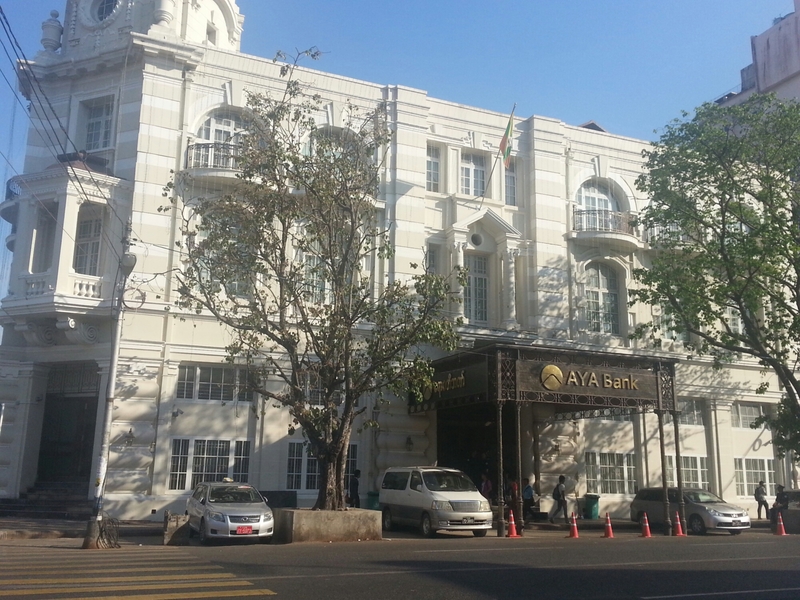 Have someone in your hotel write down all the places you wish to go to including your hotel address in Myanmar script. That way, you just show the address to your driver. 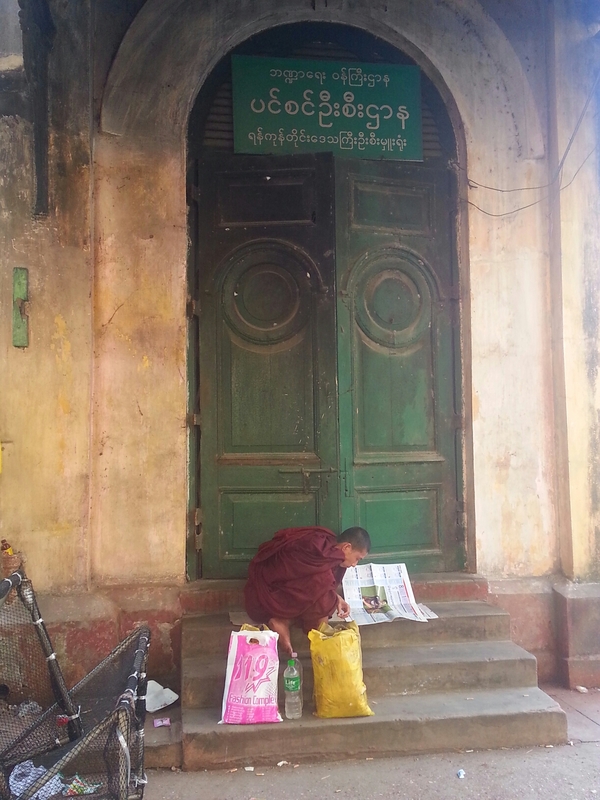 Sights listed in Lonely Planet guidebooks have Myanmar translations. Taxis have a/c but most drivers leave it off and roll the windows down. Just ask them to turn it on. They’ll be most willing to oblige. 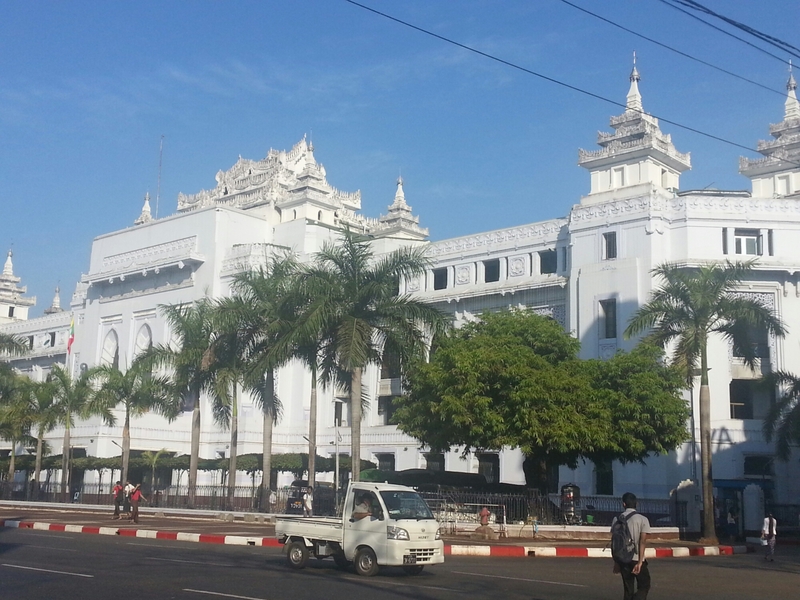 Yangon is a city best enjoyed leisurely. It’s charm grows on you. Such a bummer. Woke up this morning with the runs. Who could the culprit be? 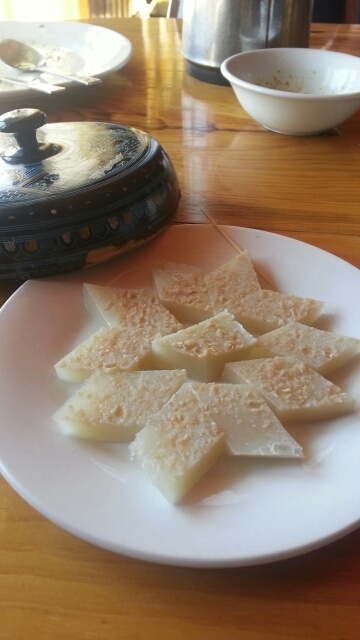 The tapioca-coconut dessert I had at the Bogyoke Aung Suun Market. See the one on the center. 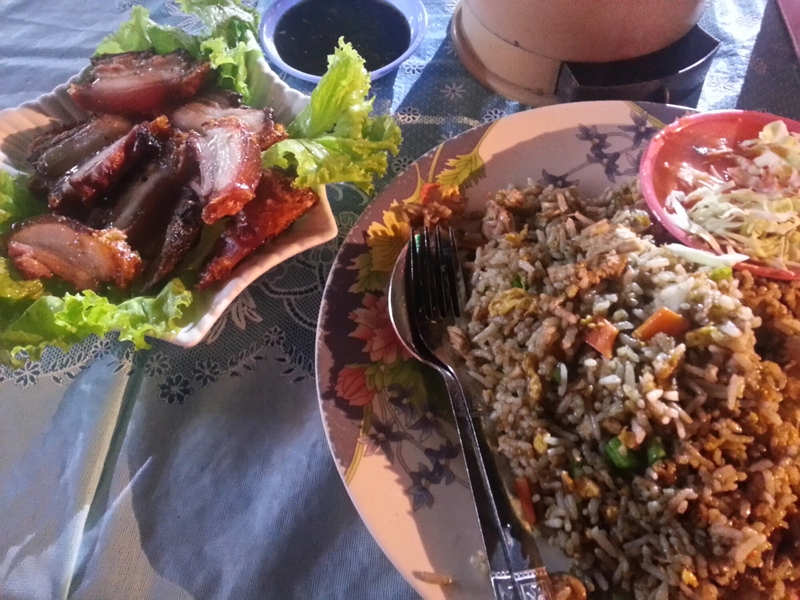 The fried rice and the crispy pork at one of the night stalls near 19th street. Sorry, I didn’t take a pic. 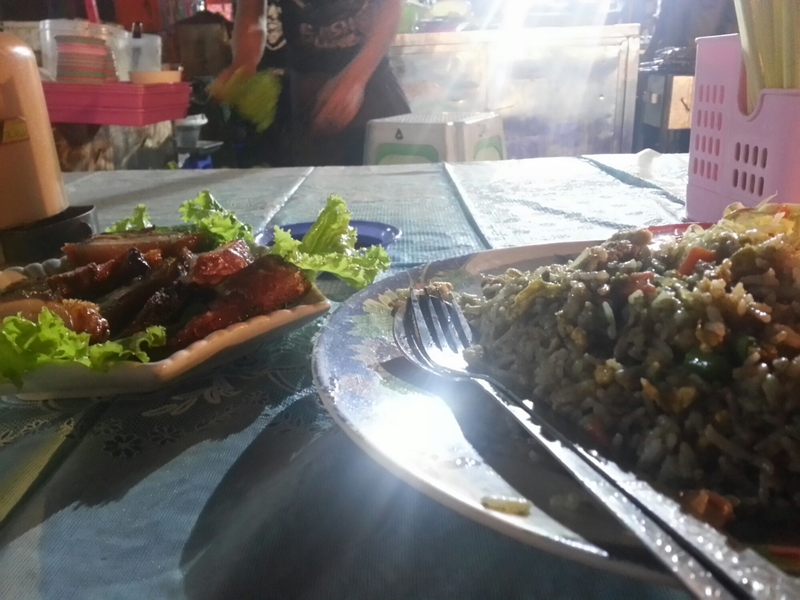 My breakfast of fried rice and beef ribs curry at a street stall. This was just the third time I had traveler’s diarrhea. 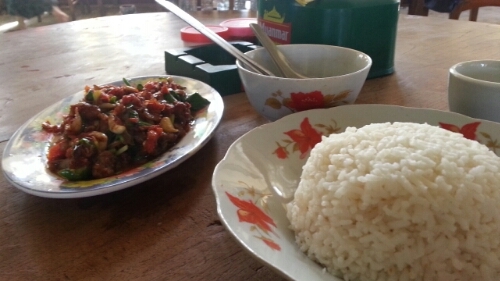 The first was from a stir-fried squid dish at a street stall in Georgetown, Penang and the second was from a beef dish in Banlung, Cambodia. Such a bummer. It means skipping the circular train ride. I did manage to take a walk around Kauwangyi Lake before heading back to the guesthouse to use the bathroom. It did seem like it was under control already thanks to the loperamide I took. 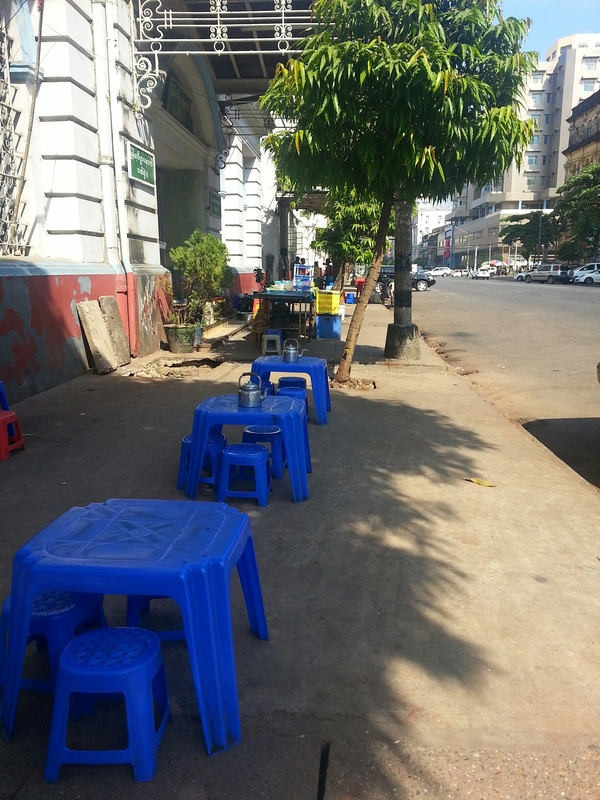 So I went to have lunch at Feel Myanmar. I had barely finished my dessert of red velvet cake when the toilet started to beckon. Thankfully, there was a Western-style toilet. Perhaps it was all that food that made my tummy go ballistic again. But I was not to be deterred. I headed to Monument Books and found a nice book on Myanmar culture with several sections on music for just 2, 500 k. Another toilet break. Someone was taking ages in the male toilet (passing-out books perhaps) so I used the female one. Fortunately, aside from the staff who were all lounging downstairs the only other customer was a kid buying a toy on his own (a car was waiting for him) and me. 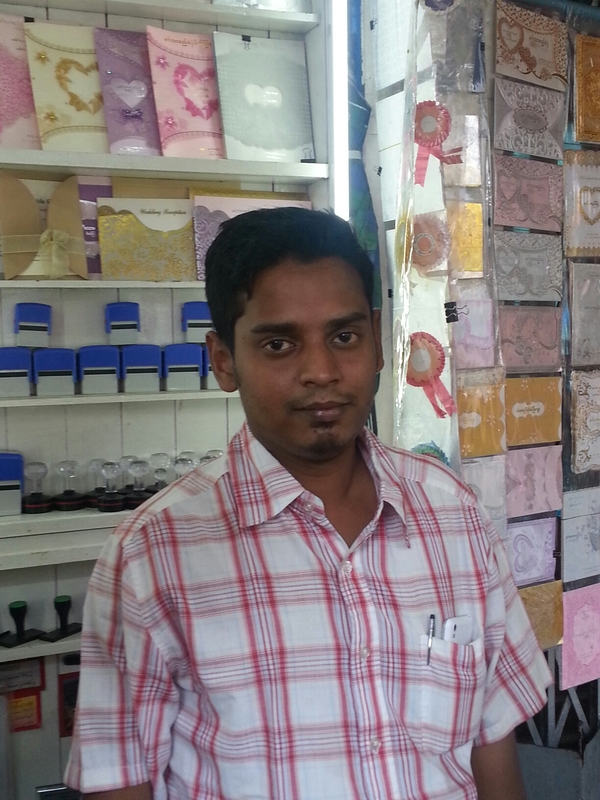 Next stop was Nanyamadaw shop. They didn’t have the books I wanted but they did have a clean toilet. I headed back to the guesthouse after to sit this thing out. Managed to get immodium tablets at a Chinese-run pharmacy. I simply pointed to my tummy and made sprinkling motions with my hands. At another store, pointing patting my tummy resulted in flatulence tablets being handed to me. I read every tablet pack there and there was no anti-diahrrea. I’m better now. Just had a piece of bread for dinner and a pot of green tea. 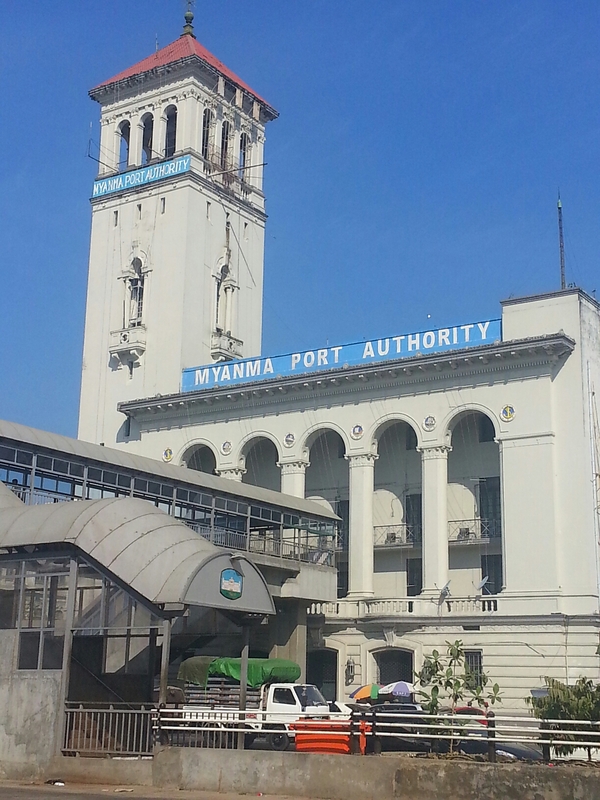 I arrived at the Yangon bus station (not sure which one) at 5:30 this morning, 9 hours after I left Bagan. 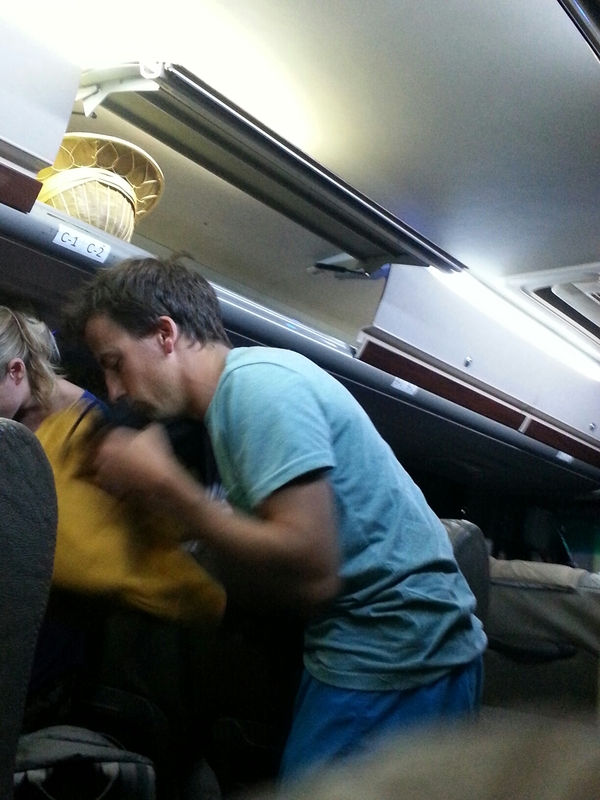 The JJ Express bus was as reliable and comfortable as ever. A mini-bus picked me up and other passengers in different hotels around Bagan then brought us to the bus station where 3 buses were waiting. I went to the counter to get my assigned bus and was given Bus No. 1. With only three seats a row, there was ample seating space and leg room. I got seat D3 which means row D, 3rd seat which is the solo seat. The luggage compartment above the seats was like an airline’s. 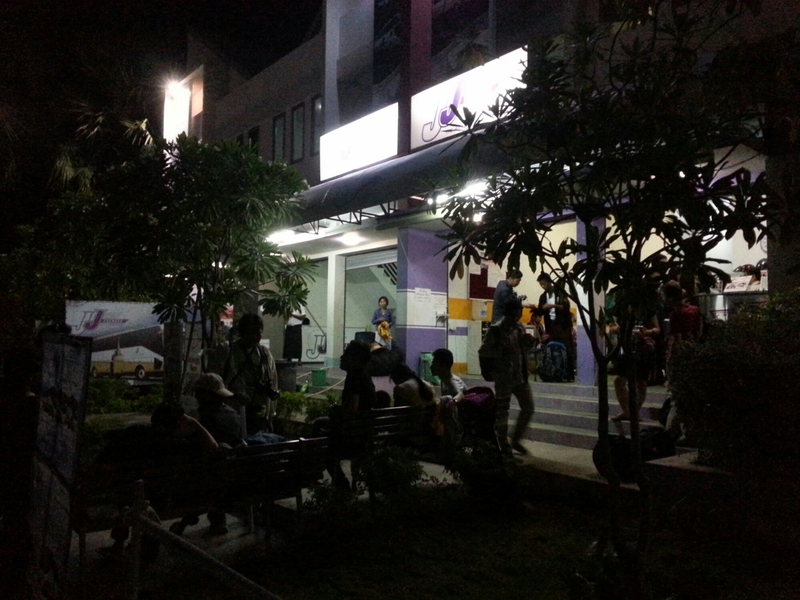 It included a stop around 10:30 pm for dinner and as is always the case with buses in Myanmar, everyone had to get off. Anyway, I took a cab (yehey for cabs!) 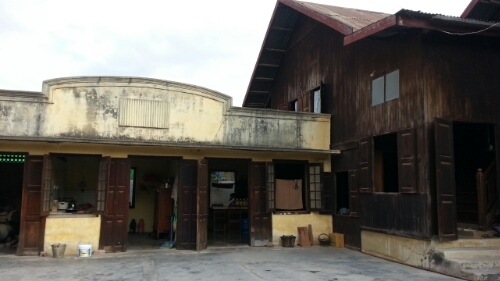 to SAT hostel in Lamadaw road. Check-in was still at 2pm so I just dropped my bags and did the Lonely Planet walking tour. 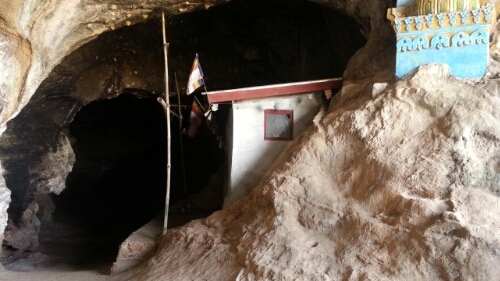 Fortunately, the hostel was walking distance to Sule Paya which is ground zero of the itinerary. 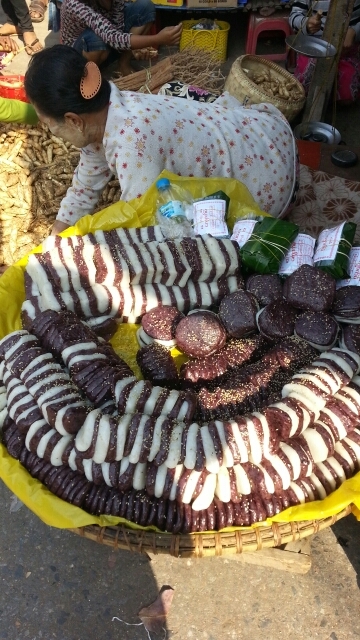 Walking to the pagoda, I stopped to look at some snacks being peddled. I was asking what they were when middle-aged Chinese guy on his way to the tea-shop beside it cheerily answered my question. 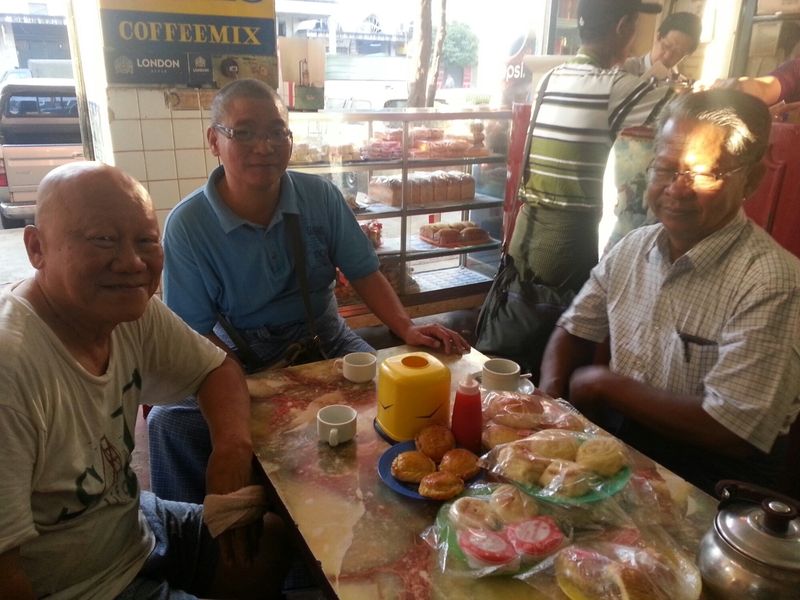 He then invited me to join him and two gentlemen seated inside for some tea and snacks. His treat! After that free breakfast, I went on my way. 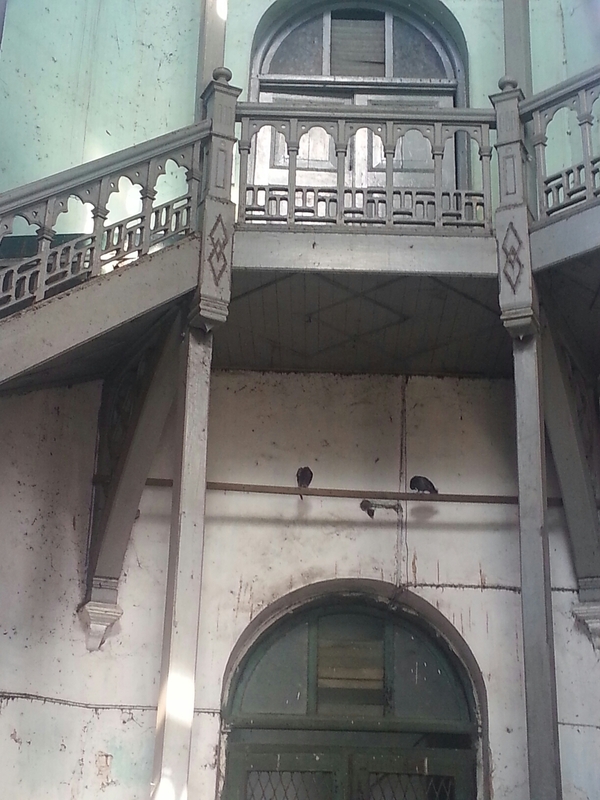 The sights below are in the order of the Lonely Planet walking tour. I didn’t take any pics of the Immanuel Baptist Church. 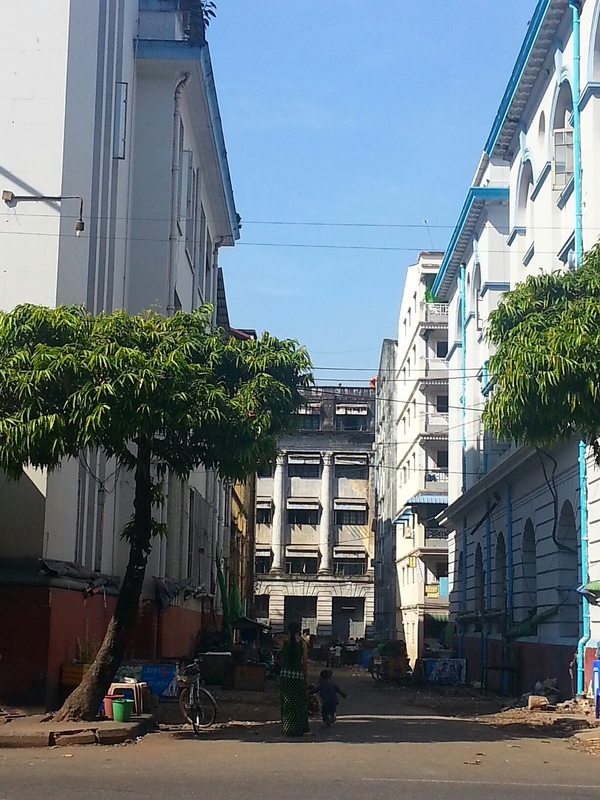 The sidewalk was closed on the way to Myawaddy Bank and the former Yangon Region Office which was being converted into a hotel. 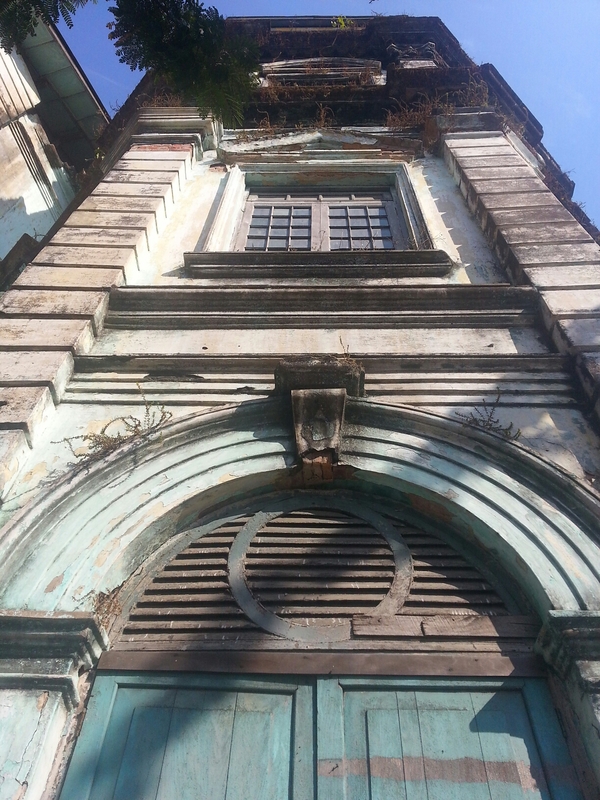 So I took a detour to Merchant Road and saw this lovely building. 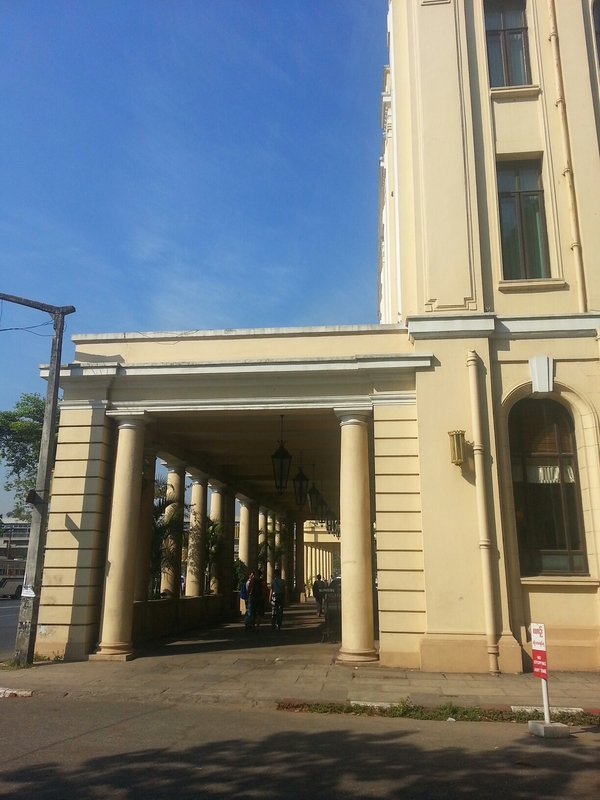 From a side street I exited to Strand Road and to the Customs House. 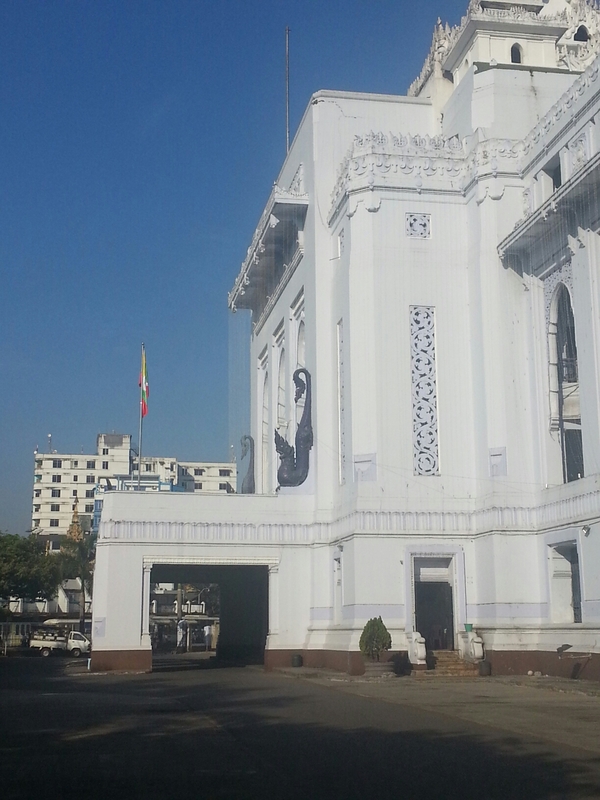 The Yangon Regional Court is one of favorites. 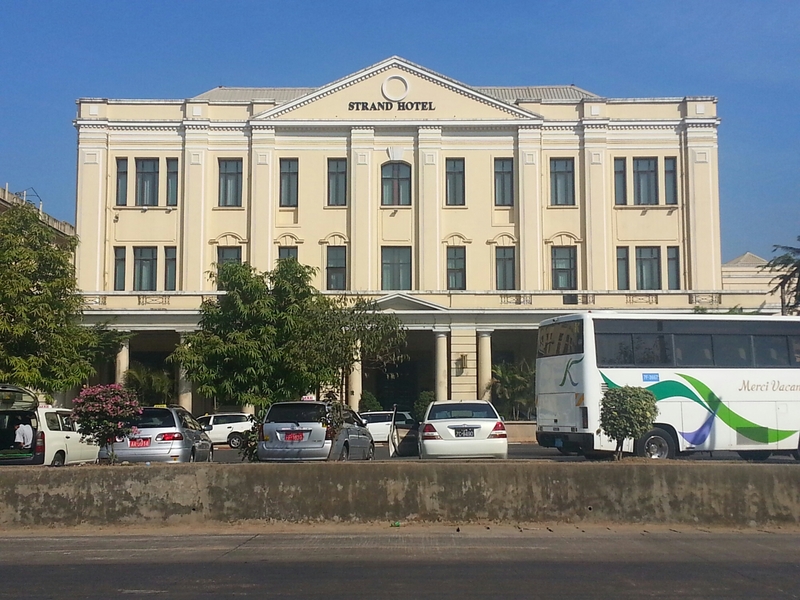 The famed Strand Hotel. 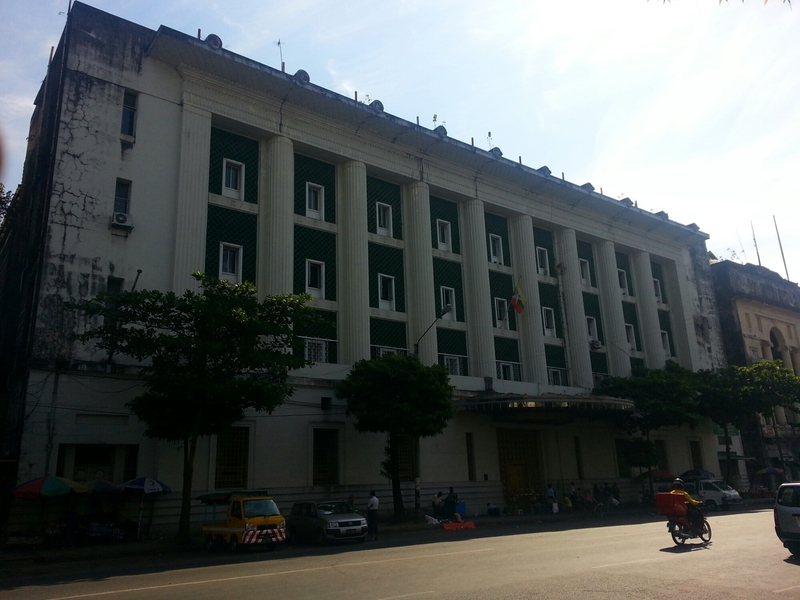 Sorry, but the other Sarkies Brothers property, the Eastern Oriental Hotel in Georgetown is more beautiful. 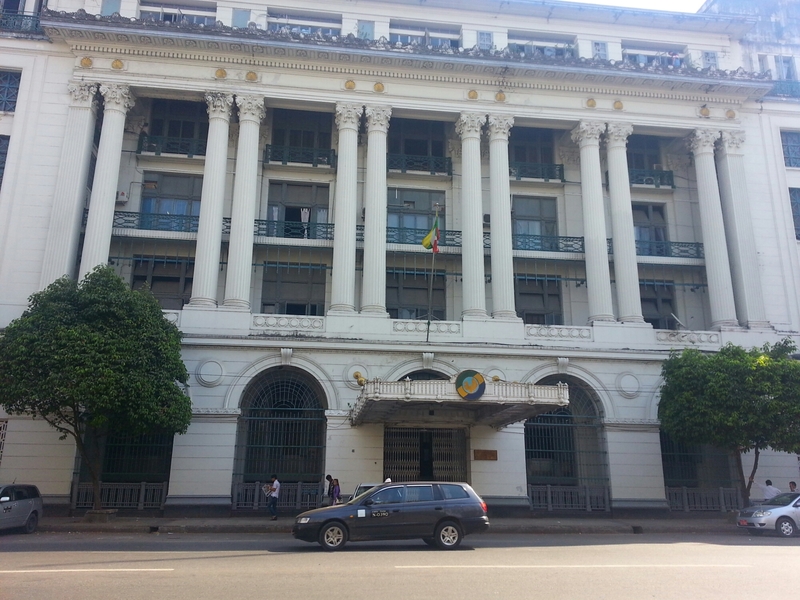 No pictures at the Central Post Office. 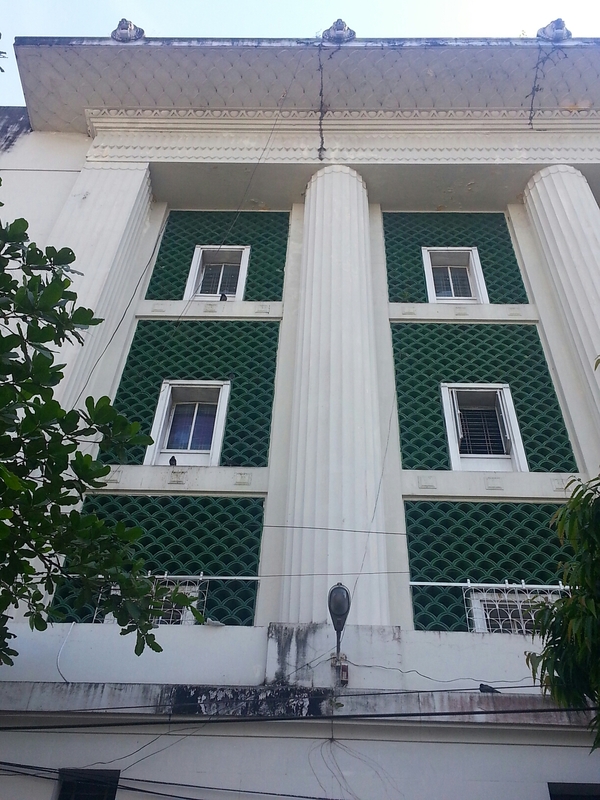 Along Pansodan are three really nice structures. 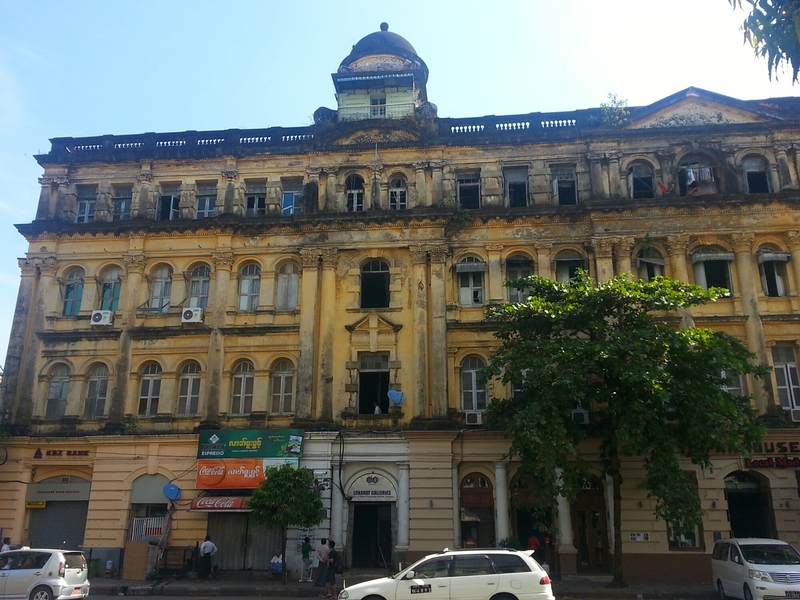 And my favorite, the Lokanat Gallery Building whose upper floors have become residential quarters. 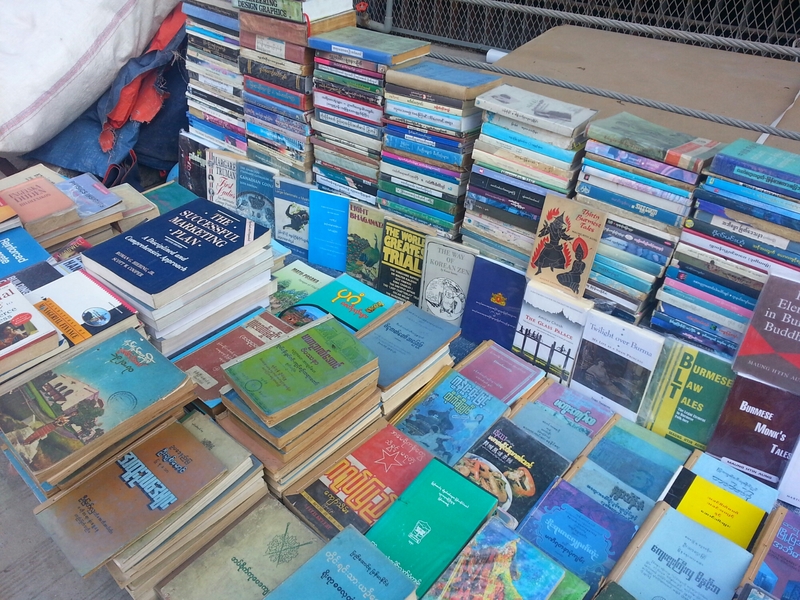 Heading back to Mahabandoola Road, I passed these bookstalls. I didn’t make it to the Ministers Office as I was hungry. Had this chicken biryani for only about Php 90. 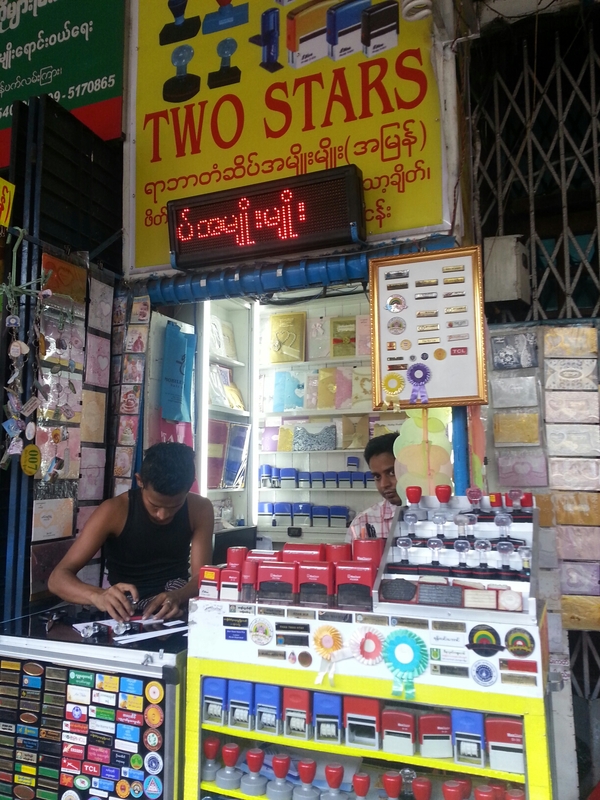 I also had some stamps made bearing my name spelled out in English and Myanmar script. Had my sisters’ names made too. 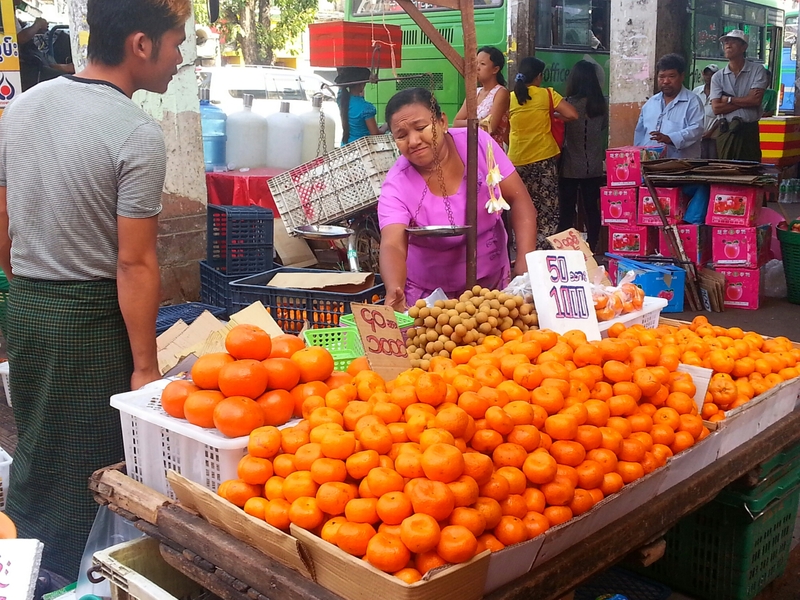 I ended my walking tour at the Bogyoke Aung Sun market. 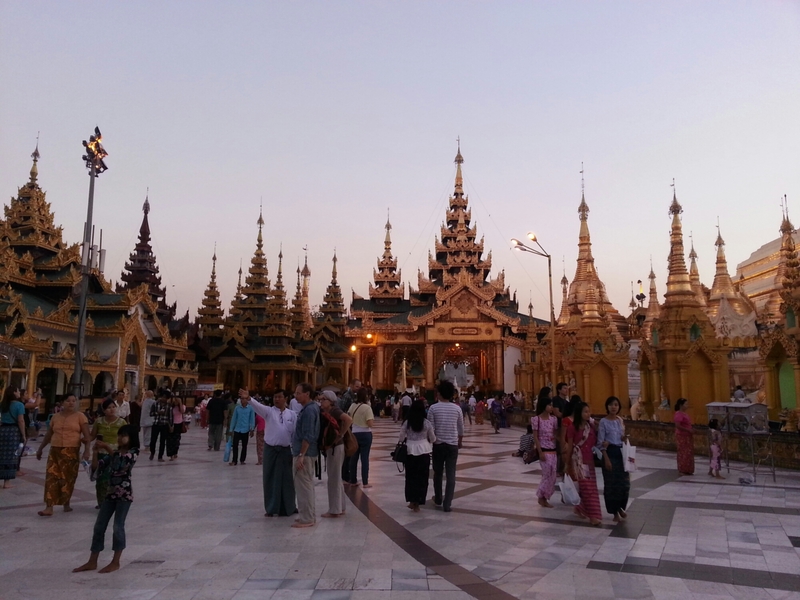 Myanmar is the country that will finally complete my Southeast Asian travel map. I had much apprehensions in traveling here as compared to its neighbors, tourism was not as developed. That meant certain comforts had to be sacrificed. Another worry was money as it was said to be more expensive than its neighbors. My two weeks there proved to me that there really was no cause for concern. 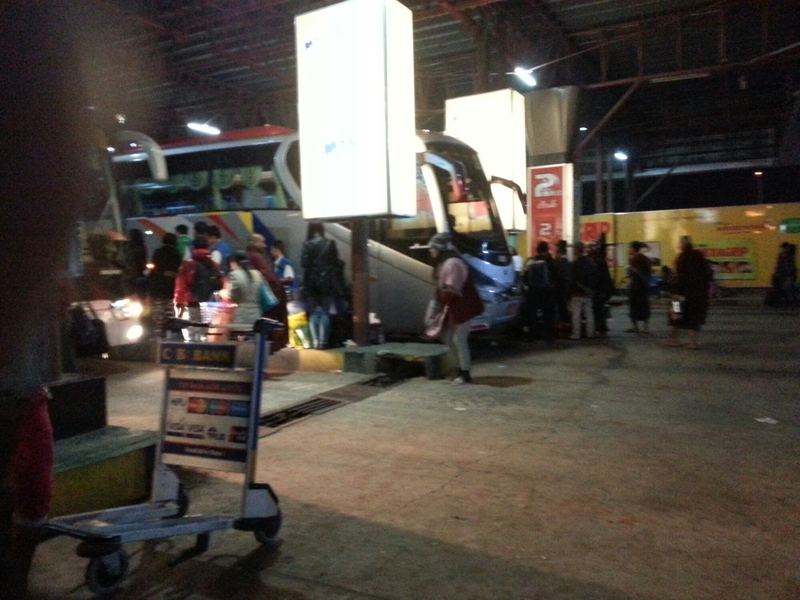 If you took Air Asia, there is a free shuttle outside arrivals. Simply board the bus and show your boarding pass. It drops passengers off at the center of town. You can also go to the taxi counter and take a shared van (5,000). They will be the one to group you with others. It will drop you off at your hotel. You can also opt for your own taxi. The airport is an hour away. Returning to the airport, if you are flying Air Asia, the shuttle leaves at the same place at 9am. Be there by 8.30. When I took it, it was just half-full. If you opt for a taxi, arranged with your hotel. Yes, I did bring crisp US dollars which I kept in a hard checkbook holder. There is a money exchange counter by the baggage carousel. 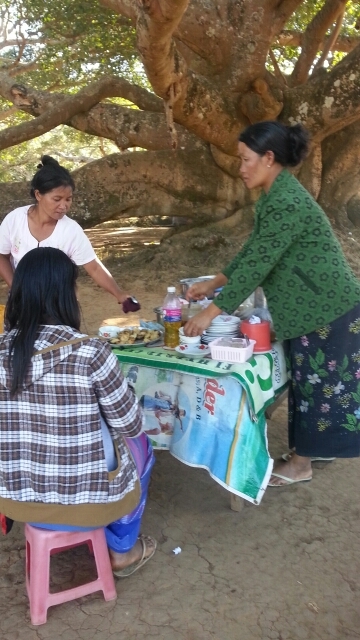 A woman was exchanging some folded USD20. One of the staff refused it but the more senior guy who was attending to me, accepted it. At the arrivals area are two exchange counters. Rate at that time is USD1=1,033 kyat. 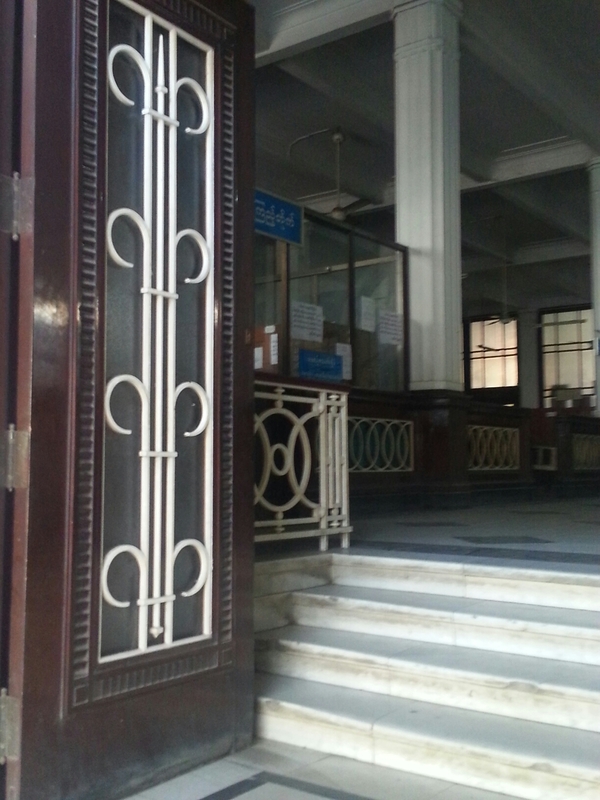 There are money exchange counters run by banks all over. 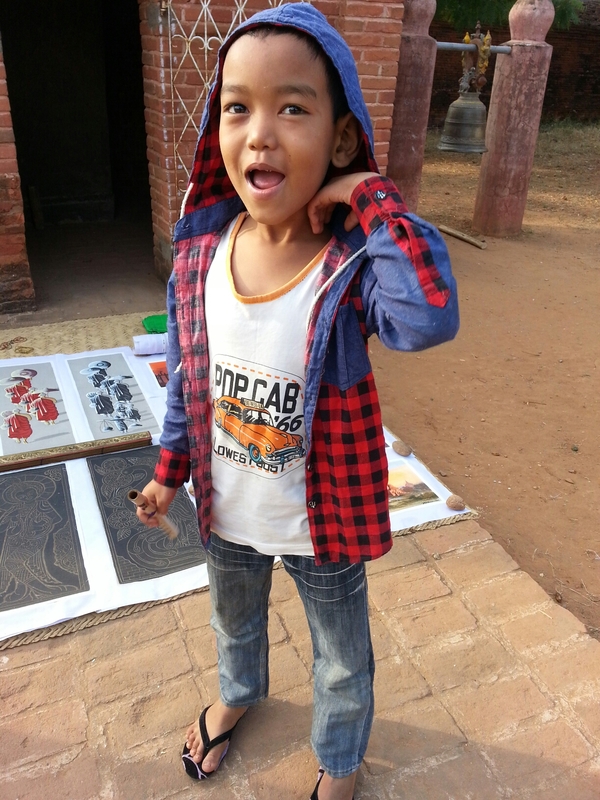 There is 1 in Kalaw and 2 in Nyaungshwe. ATMs are everywhere in Mandalay. I was able to use one with no hassle at all. 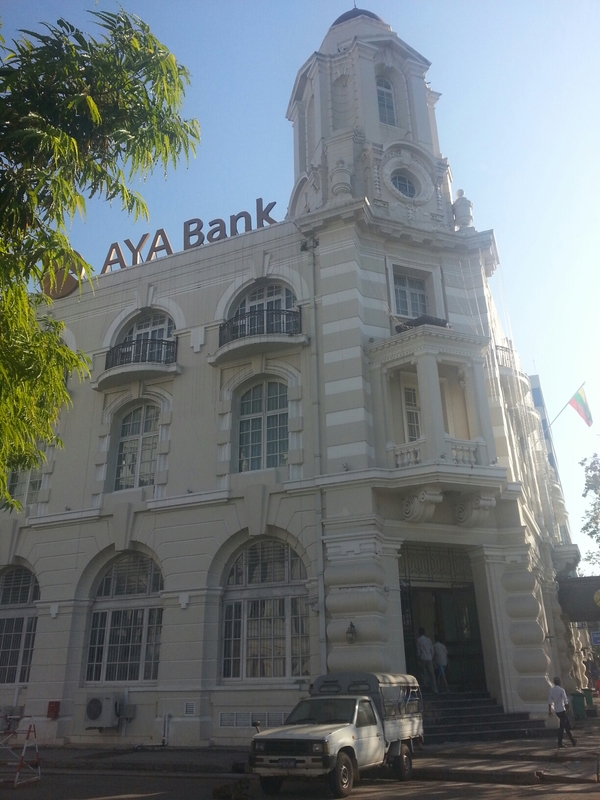 There is an ATM in Kalaw and 2 in Nyaungshwe. 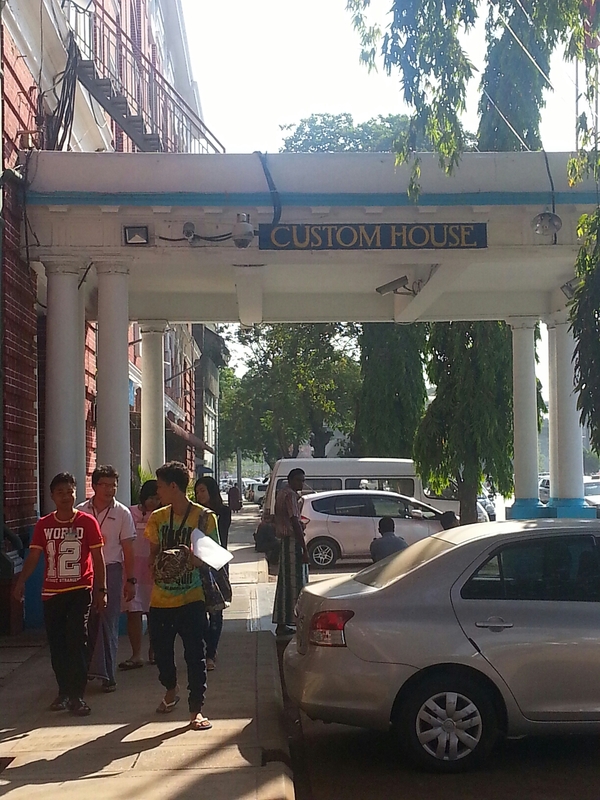 Everyone uses kyat now even the guesthouses and 1-star hotels I stayed at. Don’t know about the more expensive accommodations though. 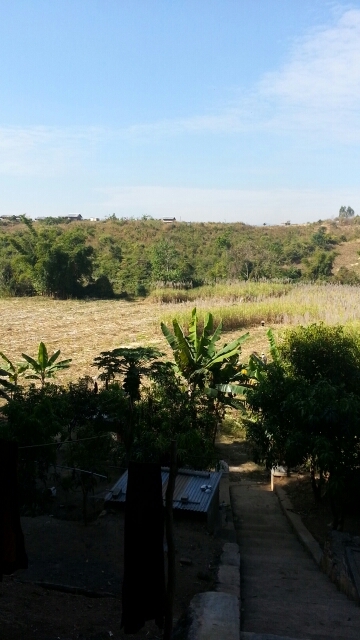 The places I stayed at (A.D1 Hotel in Mandalay, Golden Lily in Kalaw, and Joy Hotel in Nyaungshwe) all had free and reliable internet good enough for me to upload pics at FB, surf sites, and blog. Surprise! 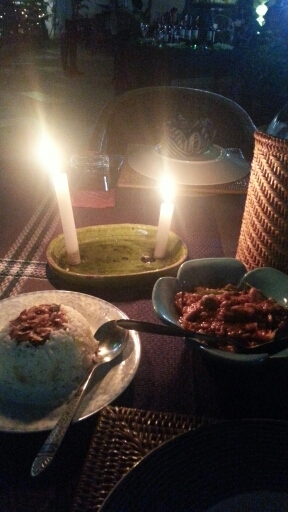 In my entire stay, there was only a brownout once (in Nyaungshwe) and lasted less than an hour. 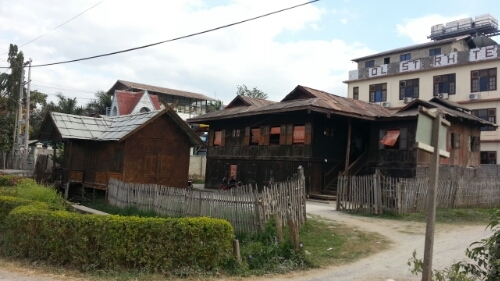 Relative to its neighbors, the accomodations are poor in value. In Nyaungshwe, the double room with private bath at Joy Hotel costs USD20 which in Vietnam or Cambodia, would only be around USD12-15. 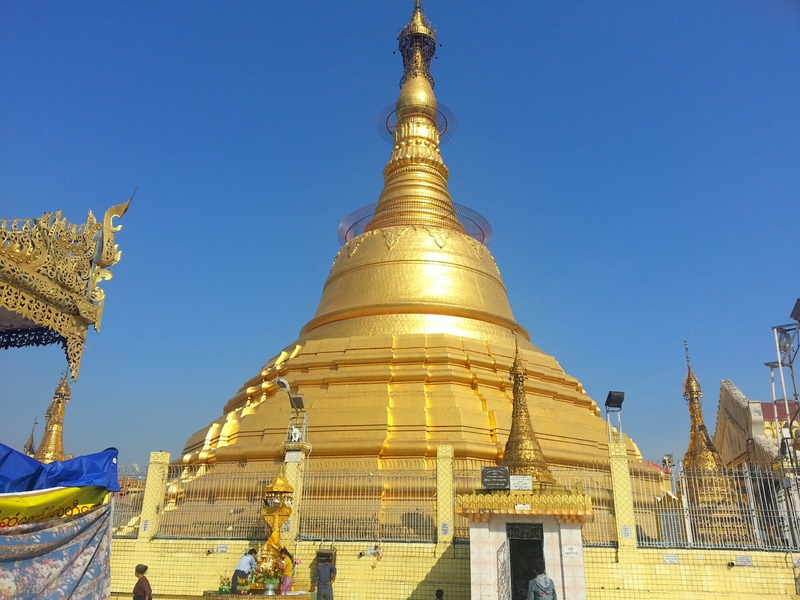 The rest–food, shopping, and some tours are quite cheap. Food is very cheap and the portions are so large it can feed 2-3 people. 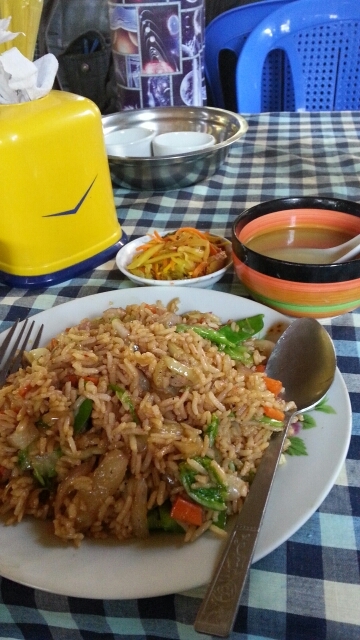 If you eat a traditional Burmese meal, it includes side dishes, a hearty soup, and rice. Refillable! 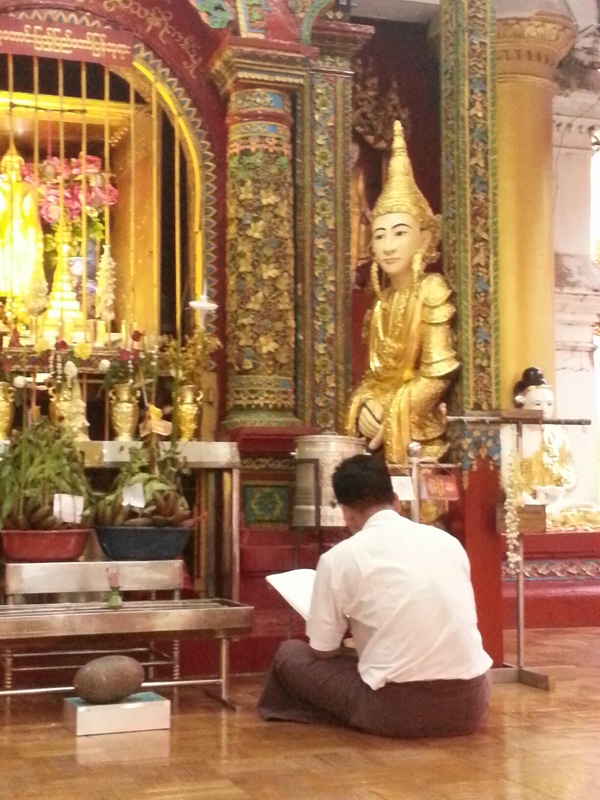 In Buddhist cultures, men are expected to enter the monastery at least once in their lifetimes. 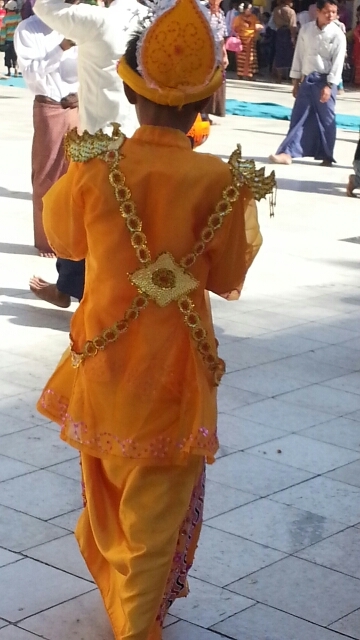 For young boys, this is accompanied with a party and finally a procession around the main temples. 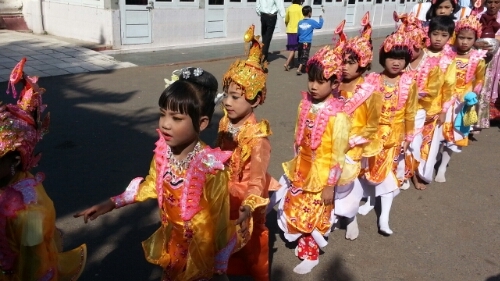 Called, shinpyu, it is a feast for the eyes as the young boys are dressed in beautiful costumes snd wear make-up. For girls, it’s also the time for them to get ear piercings. 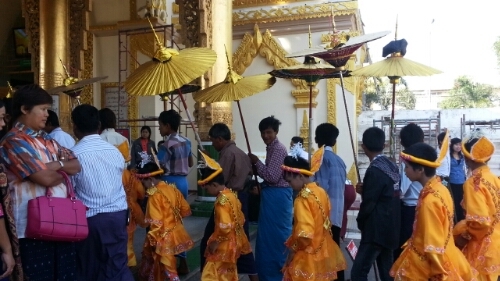 I caught a shinpyu twice on separate occasions at the Mahamuni Paya in Mandalay. 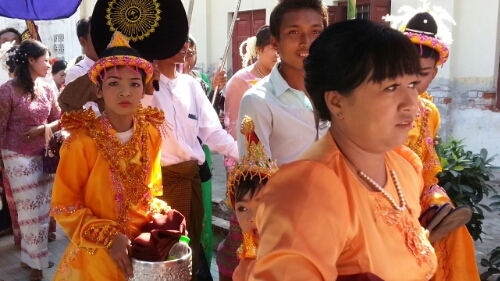 The festivities began even on the way to the temple as the convoy of pick-ups loaded with the boys and girls and their families are accompanied by much music and even dancing. 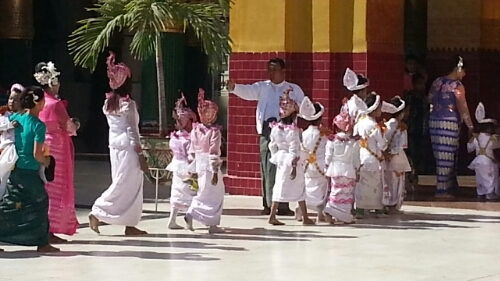 Upon arriving at Mahamuni Paya, a processinal line was formed. Behind the girls and boys are their proud families. 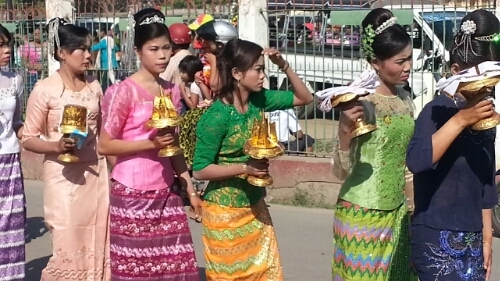 Also in the procession are young women holding symbolic objects. There are strict requirements to be one of these women. Their parents, for example, should still be alive and married. 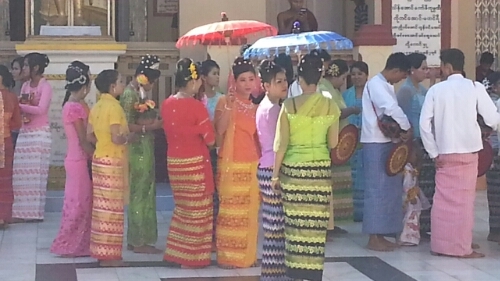 At the rear of the procession are women bearing gifts such as blankets to the monks. 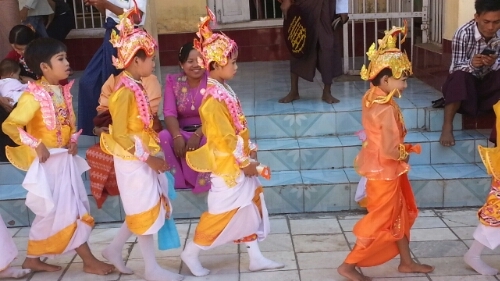 The children go to the buddha inside the temple to bow in devotion. It takes a lot of money to host a ceremony this grand. 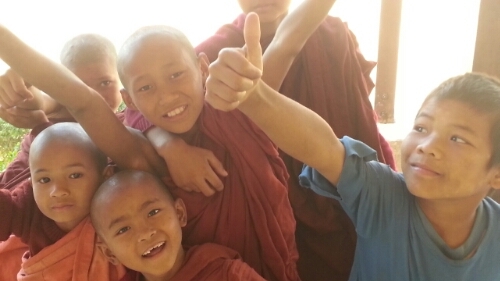 Less financially capable families simply bring gifts to the monks. 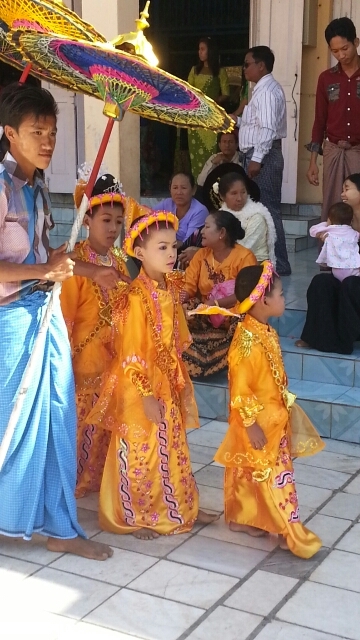 It was fascinating to watch as the children were so cute. They are dressed to look like the princes of old. The little girls are in white. Colorful umbrellas shield the children from the sun. 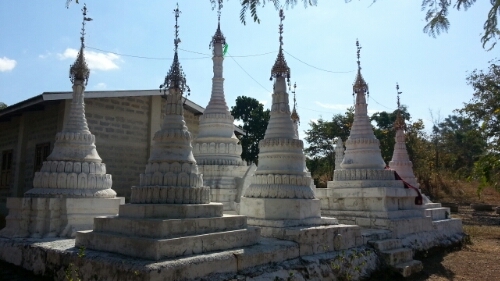 The gateway to Inle Lake is Nyaungshwe. It’s a nice town with a backpacker vibe. 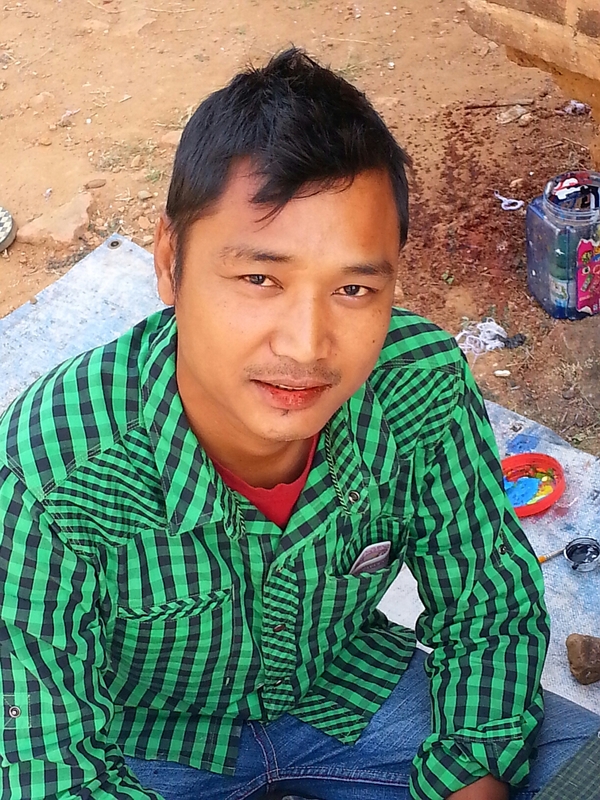 I came from Kalaw where I took a pick-up at 6:30 am bound for Tuanggyi. 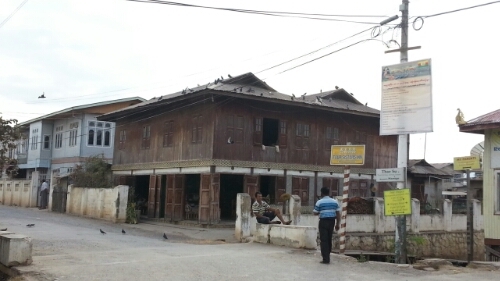 I was let-off at Shwenyaung, which is the junction for Inle Lake and hour and a half after. From Shwenyaung, you can take a taxi or a pick-up. I chatted the entire pick-up for 5,000. If you ride with others, it costs 2,000. 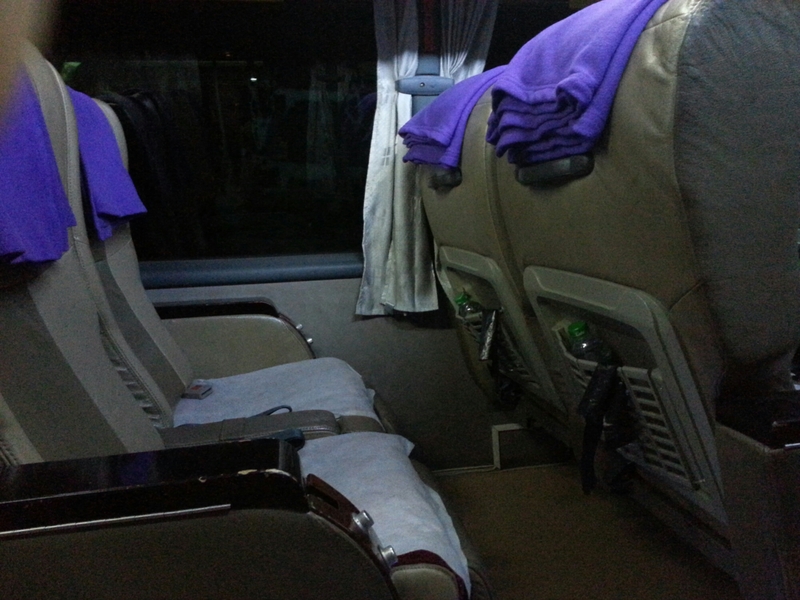 Heading to Mandalay, I bought my VIP night bus departing at 8pm at Joy Hotel. It includes transport to Shwenyaung. You get a reserved seat as the hotel calls up the bus company for the booking. 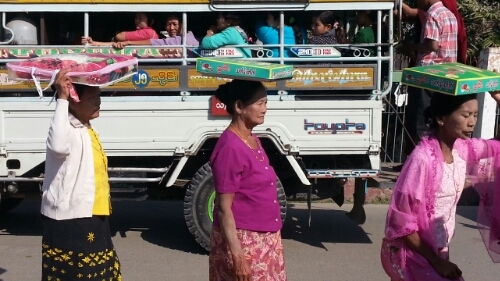 There are buses to Bagan. JJ Express seems popular. Stayed at Joy Hotel which is at the jetty. Cheap rooms with shared bathroom. 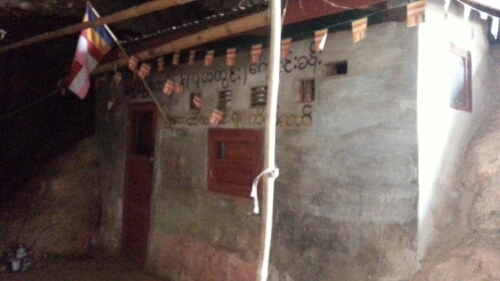 My guide told me 888 Guesthouse has really cheap rooms. 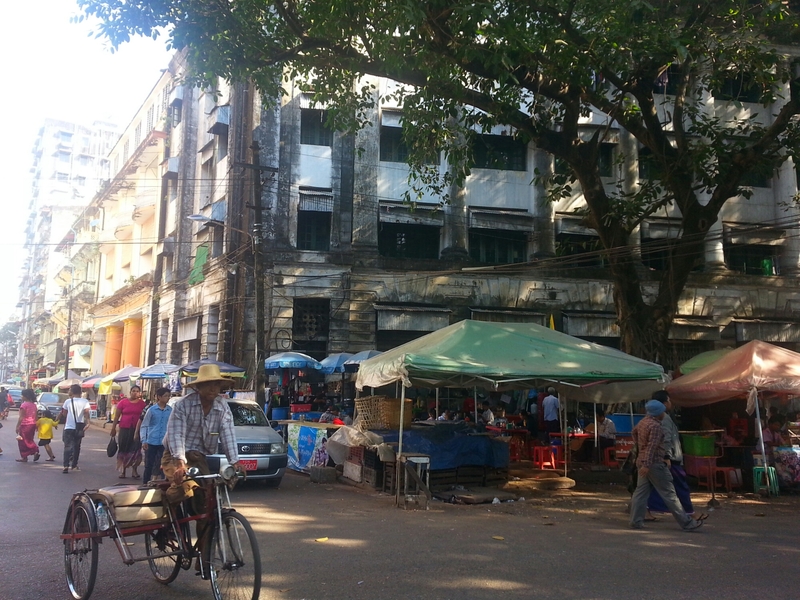 My favorite place is Sin Yaw which is just across Minglar Market. 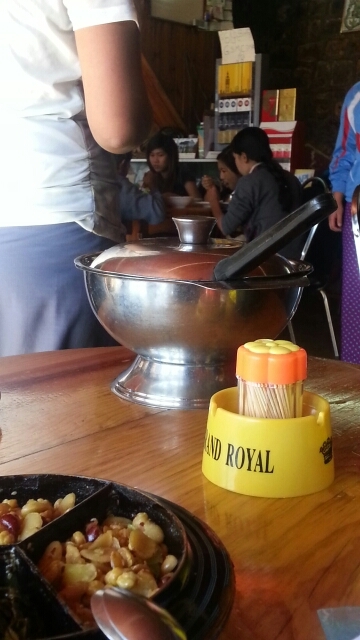 Cheerful and attentive English-speaking youngish staff and delicious Bamar, Shan, and Inle food. 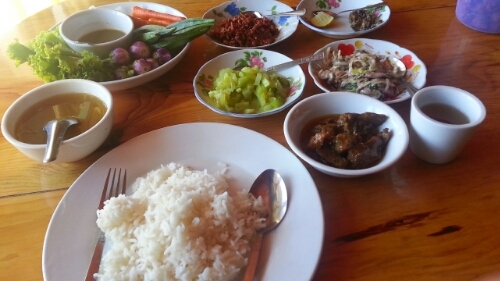 Linn Htet has good Burmese set meals. 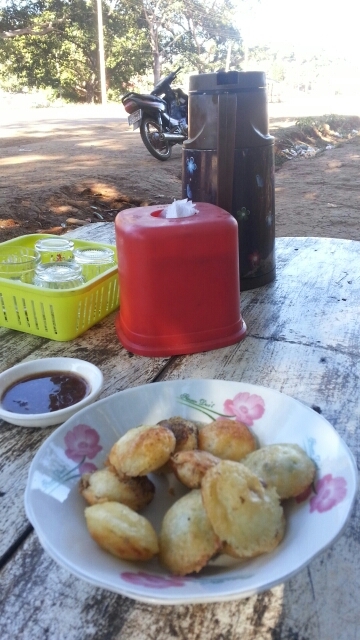 Coffee and snacks at Thu Kha. 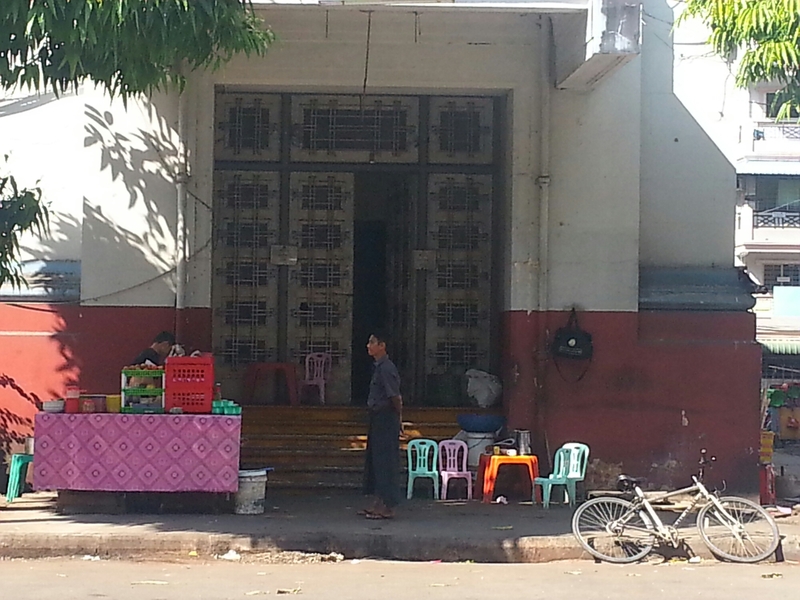 Head to Minglar Market for 500 kyat noodles. Booked a trip to Inthein for 20,000 at my hotel. 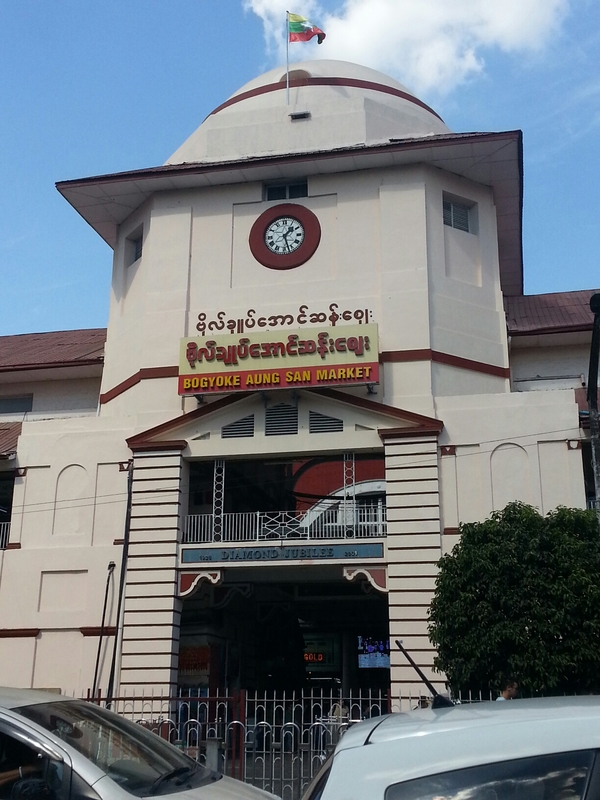 Booked directly at the boat dock for Thaung Thut and Kaik Taing for 20,000. These are standard prices for trips to the southern part of the lake. Shorter ones are 15,000. Enjoyed the 5-day markets at Inthein and Ywama. Got very nice Shan cotton shirts for less than 10,000 (bargained down from 15,000) at the latter. When bargaining, start with 50% off the quoted price. So-so. Not really worth it unless you have extra time. You van just take a bike and see the sights such as the cave monastery and the winery. I was told that the overnight trek is better. There is a KBZ bank and atm machine across Minglar Market. 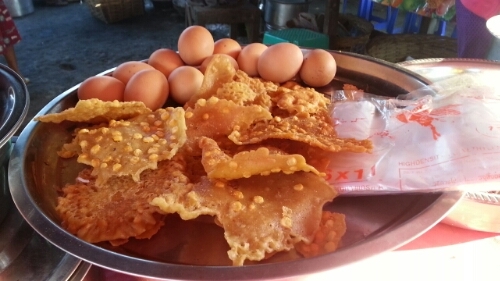 Traveling in Myanmar is an adventure to the taste buds. 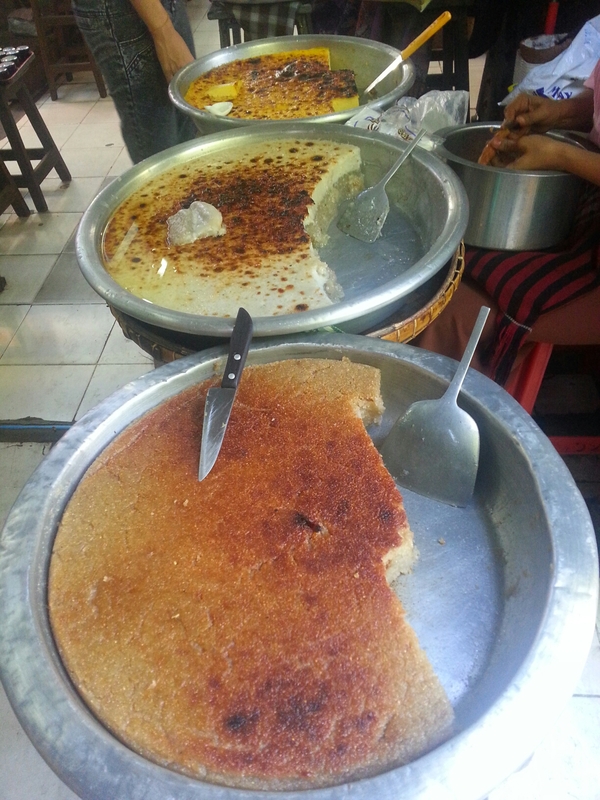 Sure, you come across familiar stuff such as Indian breads and Chinese dough sticks due to the heavy influence of these cuisines, but the rest are uniquely Bamar. 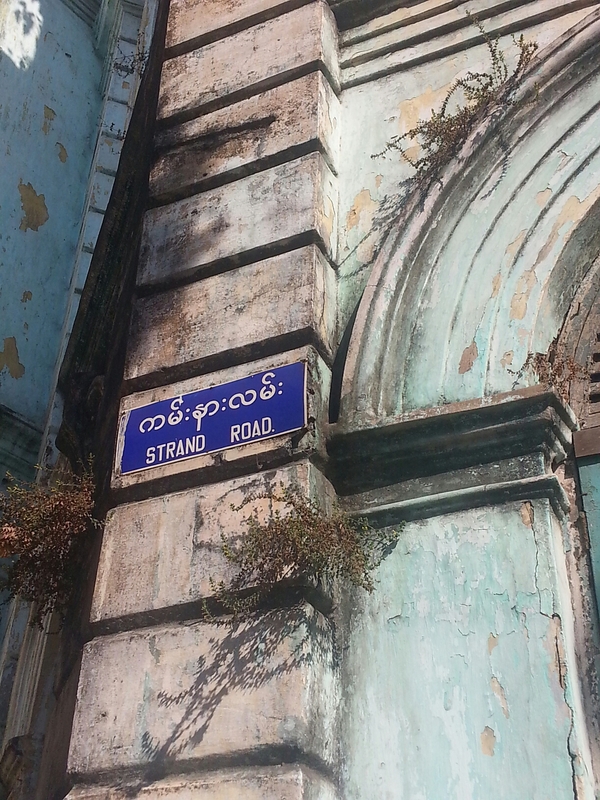 Myanmar shares boundaries with India and China in the north so it is inevitable that their cuisines should mingle. 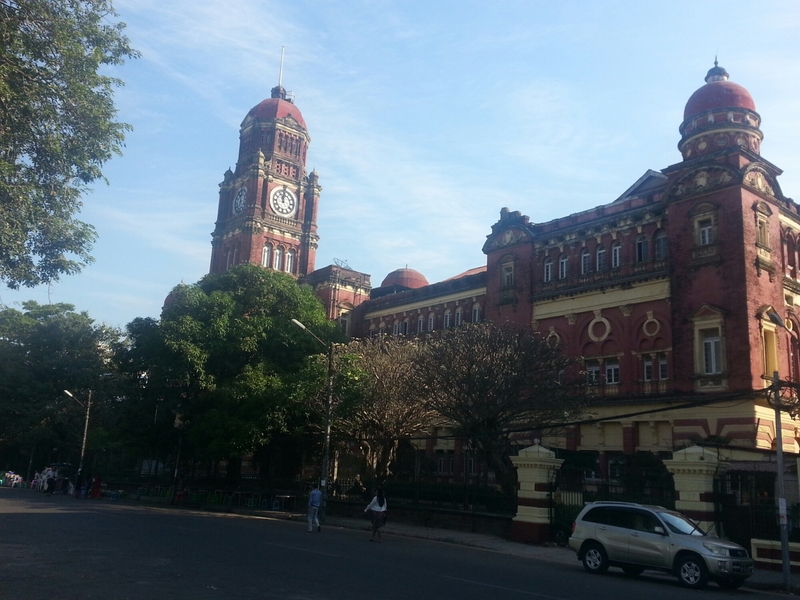 In addition, the British brought many Indian workers during the colonial period. These migrants brought their cuisine with them. 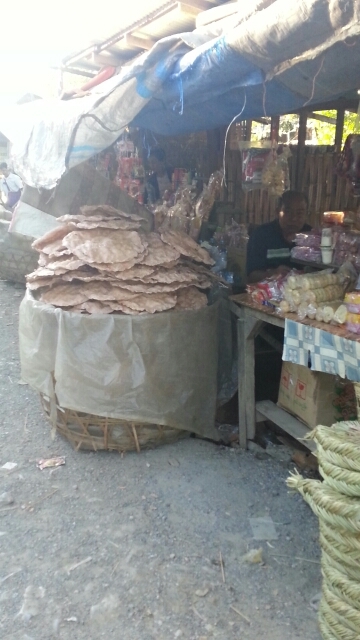 These big crisp breads are similar to Indian papadom. 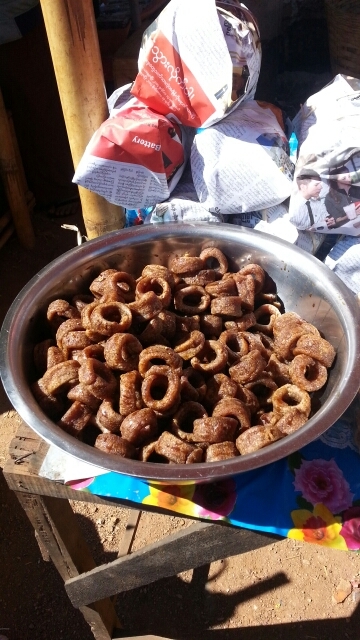 Roadside stalls in Ngauyungshwe near the jetty is the place to find these. 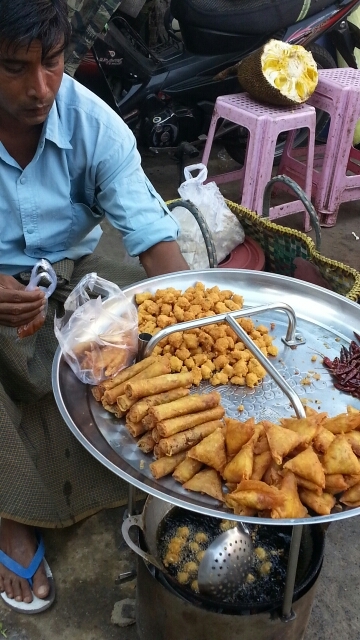 Unlike the Indian samosas, these are lighter and less spicy. Of course, the Chinese are everywhere. 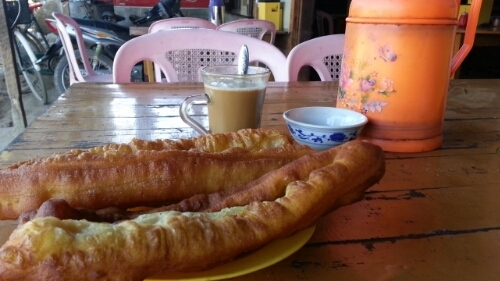 These Chinese dough sticks are very good with coffee for breakfast. 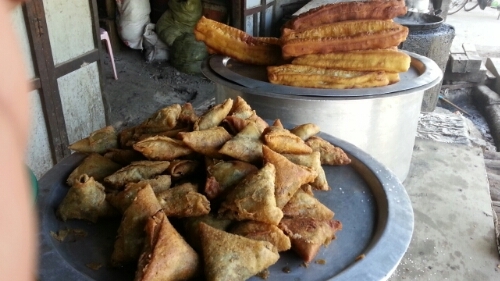 Do take note that these “foreign” cuisines have been adapted and assimilated to Myanmar cuisine in general so the samosas are Myanmar as much as they are Indian. 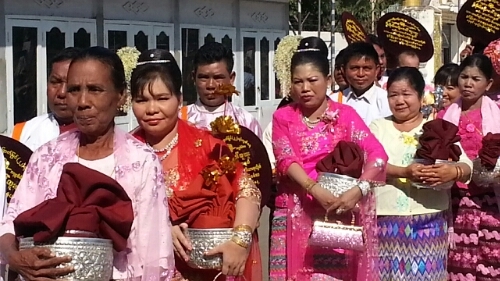 The Bamar are the dominant ethnic group in Myanmar. The food is very good. Admittedly, those not used to the strong flavors of Southeast Asian cuisine will need to get used to it. There’s a liberal use of ginger, mint, chili, and other spices. 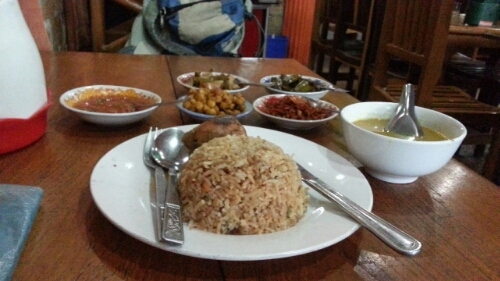 A traditional Myanmar meal consists of a main dish (your choice of curry) and an entire slew of side dishes, dipping sauces, rice, and lentil soup. 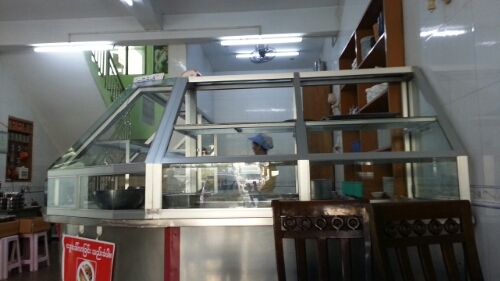 In a restaurant serving Myanmar food, you simply choose your curry and the rest of the dishes and dessert come packaged in. Except for the main dish, the rest is refillable. Waitresses are always on the lookout approaching you with “Do you want more?” Your gluttony will no know bound here. The friendly rice bowl from which your attentive waitress will refill your plate with. Dessert is a plate of white gelatin and laphetthoke which looks more like a salad than dessert. 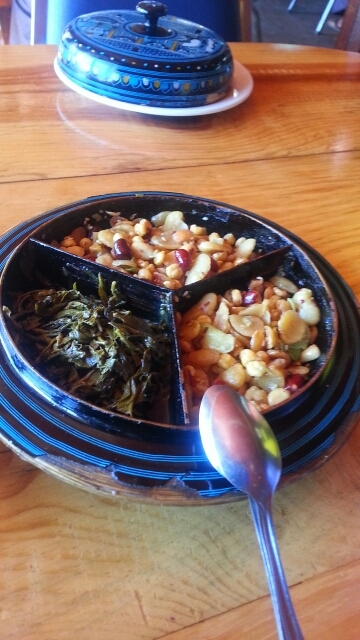 You mix a variety of fried nuts to pressed green tea leaves thatv have been cooked in a little oil. Looks strange but quite good, really. No-frills eating places called t’amin zain (rice shop) specialize in these. 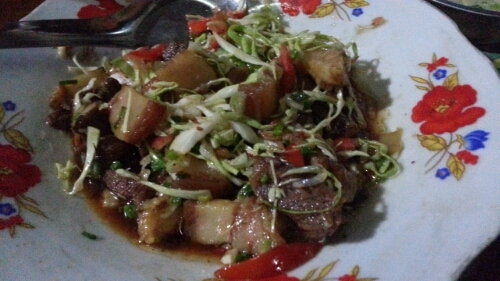 In Bamar cuisine, pork makes its appearance in a salad of chopped cabbages in a slightly salty soy sauce dressing. A unique item that I truly enjoy and which is served the whole day as a snack or with breakfast food is tofu made from yellow-split peas. They’re cut into small squares and fried to a beautiful golden color. Crisp on the outsidec and pillowy soft on the inside. It has a milky egg-like taste. Very good especially when dipped in a soy and chili sauce. Because I traveled around the Shan State during my entire trip in Myanmar, I had the opportunity to try Shan cuisine which is similar to northern Thai, where there are also Shans. 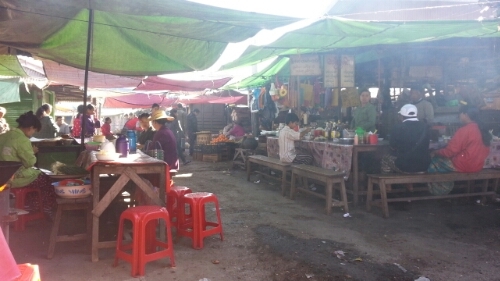 Nyaungshwe has lots of eateries specializing in this cuisine. I had a very very good pork in soybean paste at Shan Land. 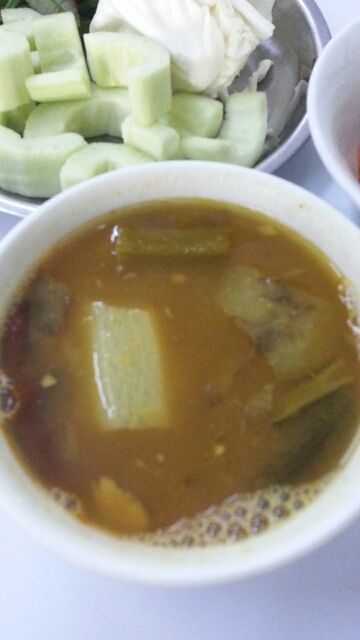 The balance of the saltiness of the soybean paste and the thinly sliced ginger was just perfect with steamed rice. Another Shan favorite is noodle salad. 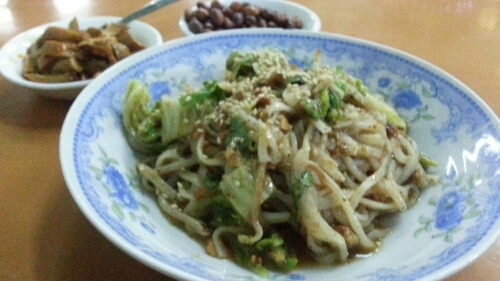 Thick chewy noodles are mixed with a peanut-based gravy. Soooo good. 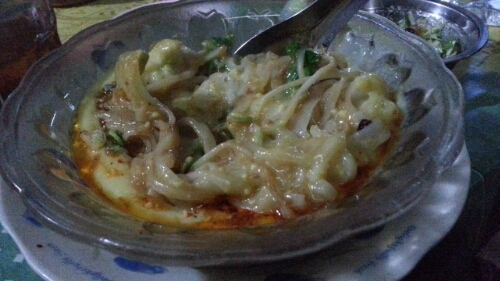 This Shan noodles dish has a gravy made of tofu. It’s rather oily but really good. 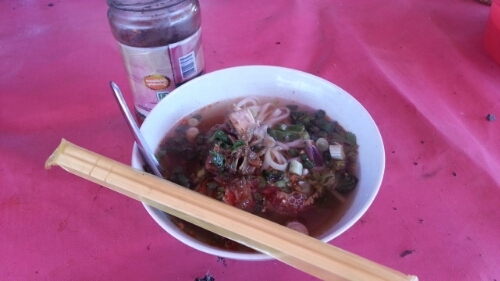 I had this at one of the stalls in the small night market at Ngauyungshwe. If you can’t get away from your fried rice, fear not. This old stand by is everywhere. Snacks are everywhere and you can keep your tummy happy with these. The word for snacks is mont. 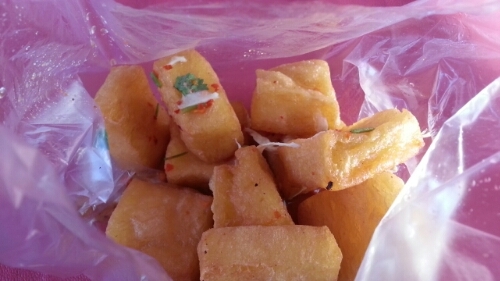 This sweet and sticky snack called mont lak kaw is well… sweet and sticky. Tastes a bit like our caryoka. 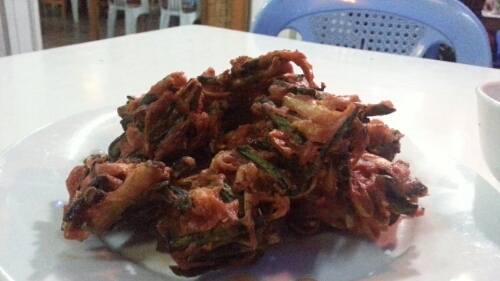 Fritters and other fried stuff are cheap, yummy, and filling. You can find them at street corners, tea shops, and eateries. They may be eaten as snacks or as part of the meal. In eateries geared towards tourists they may be referred to as “tempura” in the English menu. The round one is fritter of mashed bananas while the flat one is of vegetables. This is a crisp fritter with nuts. This one is made of spring onions and other vegetables and dipped in a mildly hot tamarind sauce. This looks like okoy complete with shrimps. Saw this one near the U Pein bridge at Amarupura where there were many seafood snacks. 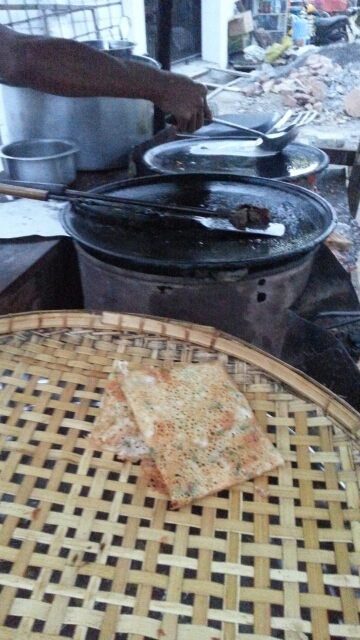 Every evening at a corner near a msin road in Nyaungshwe, this man sells this flat and crisp thin pancakes with spring onions. 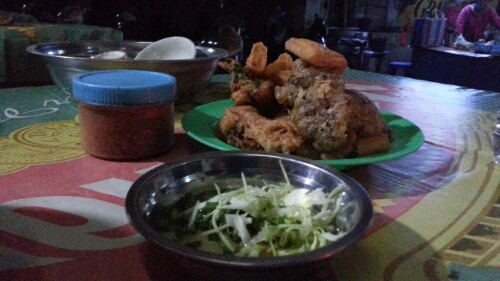 In the evening, locals have these fried food with beer. 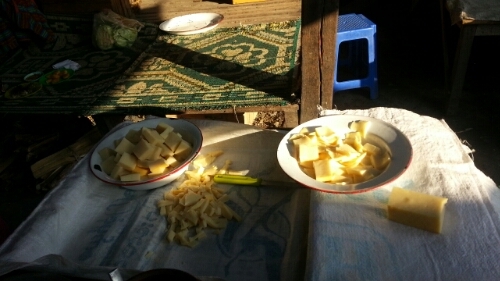 Some are served with a bowl of dipping sauce made of what looks like lard with finely chopped cabbages. 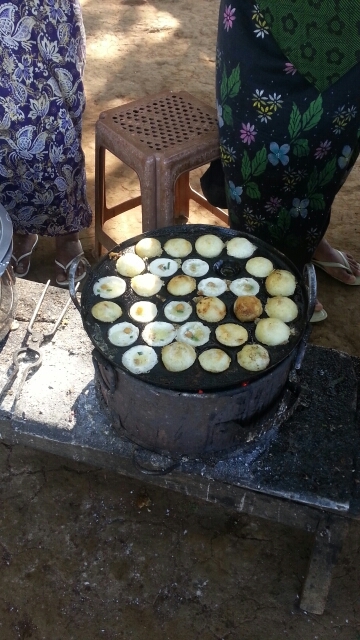 What would a Southeast Asian country be without some sticky rice cakes sold in a basket? There’s also ice-cream. 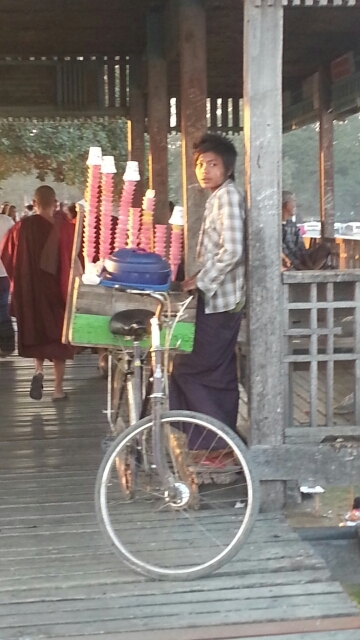 This guy is peddling some at U Pein bridge in Amarapura. Lots of Indian snacks. 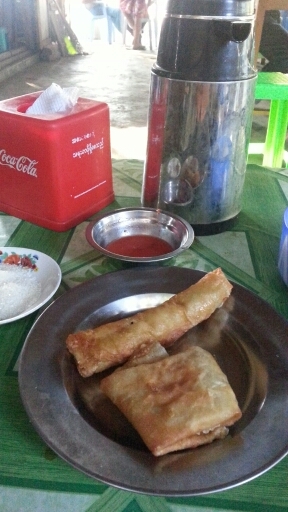 In Kalaw, I had 2 paratha breads and 3 vegetable samosas for the equivalent of less than Php 30! That is dirt cheap. 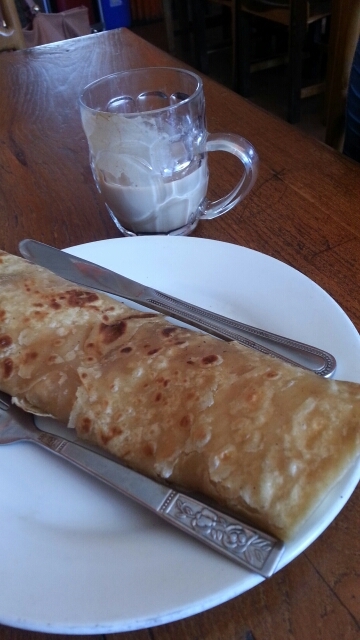 A snack of banana chapati and coffee at Everest so I can use the wifi and write my blog. 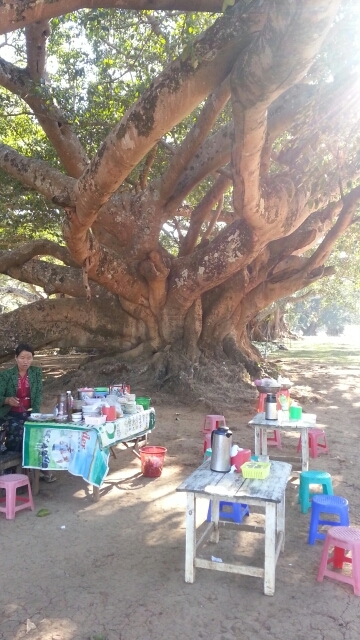 The best snack is taken under a large tree. These egg-like things are similar to the ones sold in Thailand but these are savory rather than sweet and are doused in a spicy sauce. 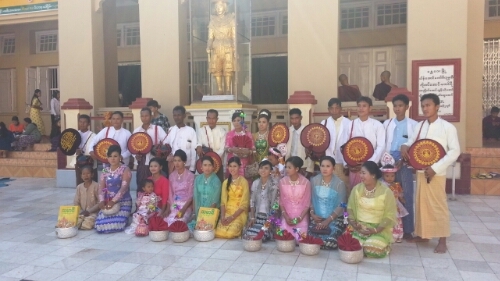 They’re called mont lin ma yar. 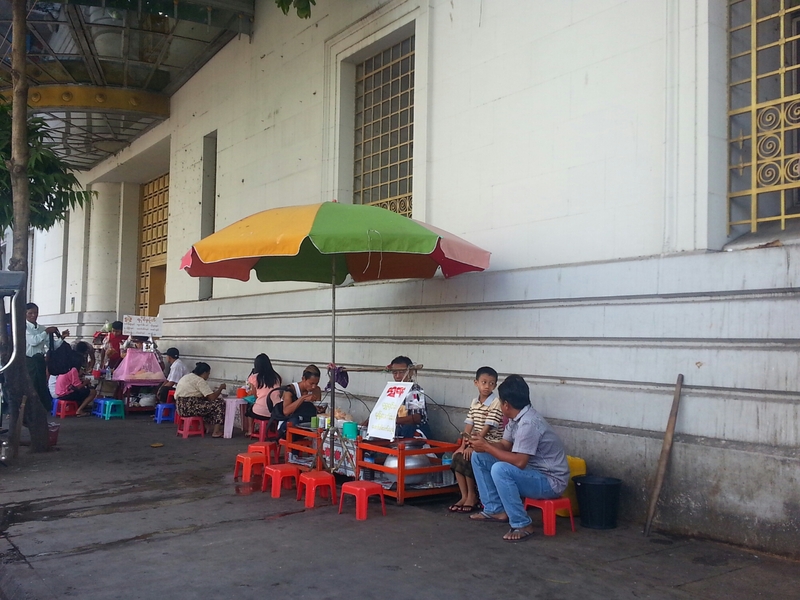 Myanmar is probably the cheapest place to eat in the whole of Southeast Asia. The servings are big and there is so much food served to you. 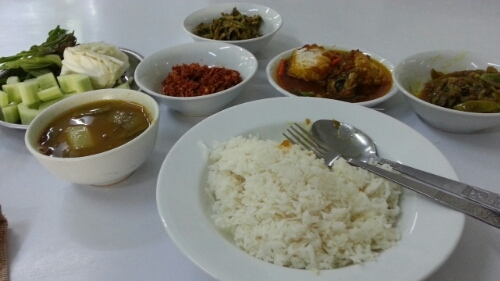 This meal at Too Too Restaurant in Mandalay only costs about Php 120. 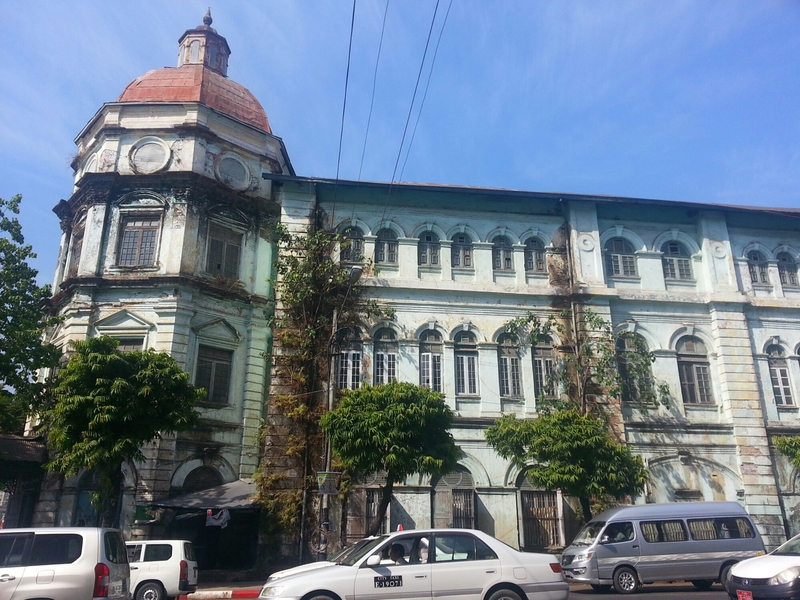 The most expensive meal I had was at Green Elephant in Mandalay. 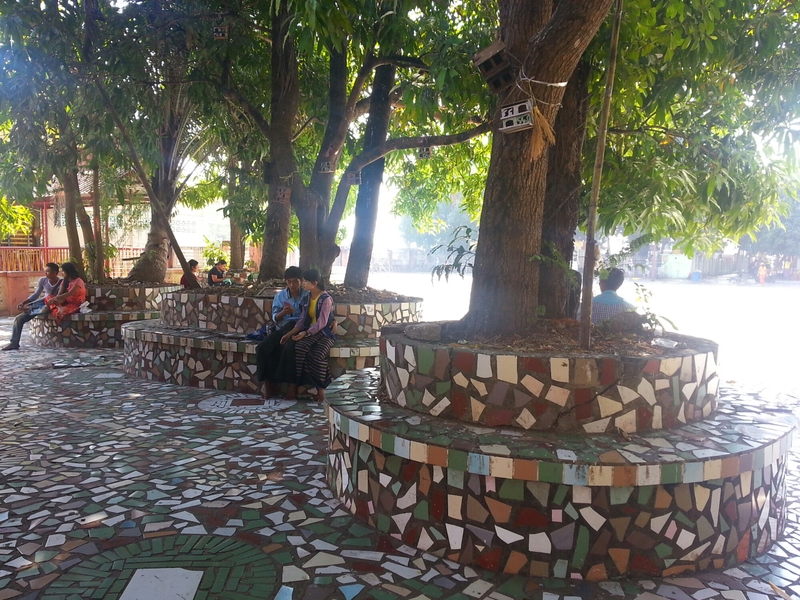 Geared towards tourists, it has garden seating, candel lit tables, and nice presentation. They even hand you a bottle of mosquito repellant when they seat you at your table. 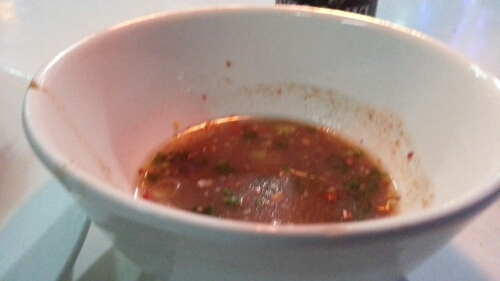 The button mushrooms cooked in spicy shrimp balachaung (a kind of paste) was very good. On the cheap side, one of the cheapest meals was this bowl of Shan Noodles at a restaurant fronting the lake in Pindaya. 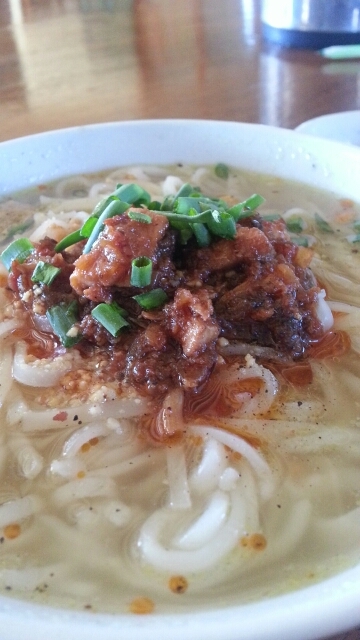 The noodles are chewy and the broth tasty with a mild chili. Markets are great places to eat tasty, authentic, and cheap food. This bowl of Shan noodles at Minglar Market is around Php 23. 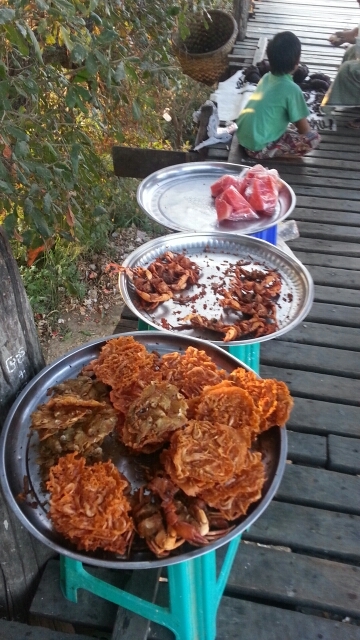 Tourist spots would always have a shack selling some snacks and basic meals such as this one by the walkway to Thaung Thut pagoda in the southern end of Inle Lake. Don’t be put off seeing fried this or fried that. The meals are quite good. 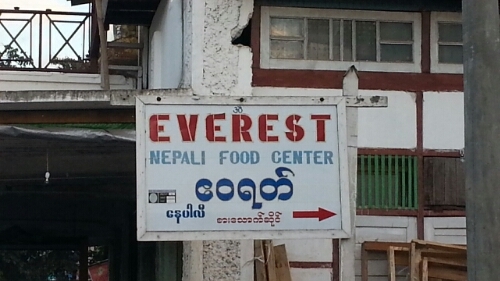 In Kalaw, you can say to your friends back home that you’ve eaten at Everest. 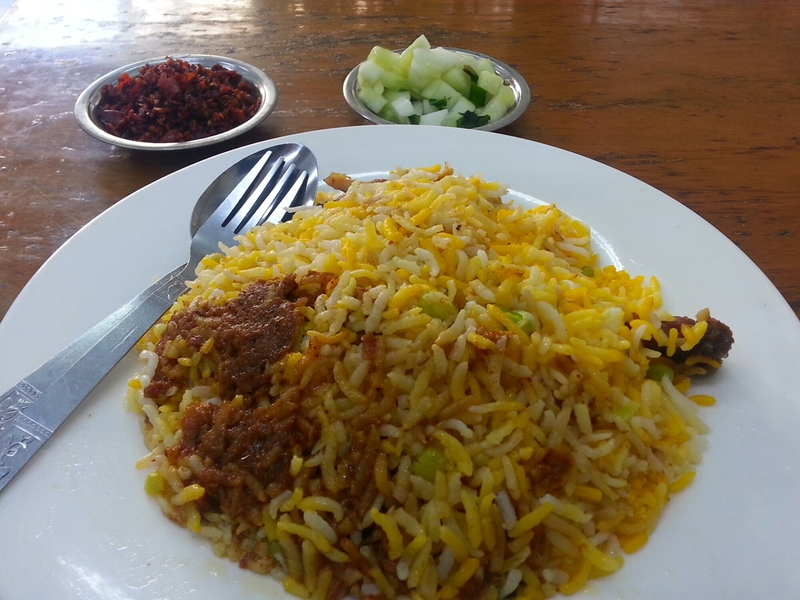 Their chicken biryani which is only served on weekends come with soup and side dishes. 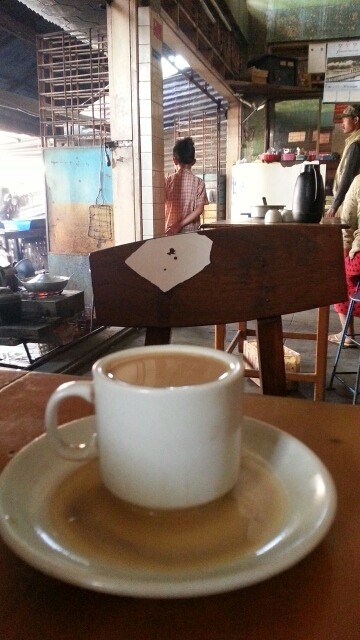 Myanmar coffee with milk is good especially the freshly made one. I had a cup at a small shop near my hotel in Mandalay. It only cost Php 9! 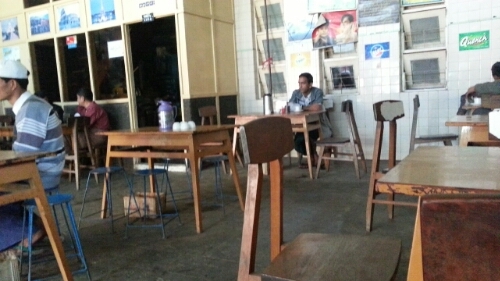 There are many many tea houses and weak tea is served free in restaurants. Skipped the egg and toast breakfast at the hotel and headed to Minglar Market for some good local and cheap breakfast of Shan noodle soup and tofu. I really like toe tofu. It’s pillowy soft and tastes like egg. Walking back to the hotel, I couldn’t resist havinffreshly fried dough sticks and a cup of coffee. I’m gonna miss all these. Spent the rest of the day just walking around the town. 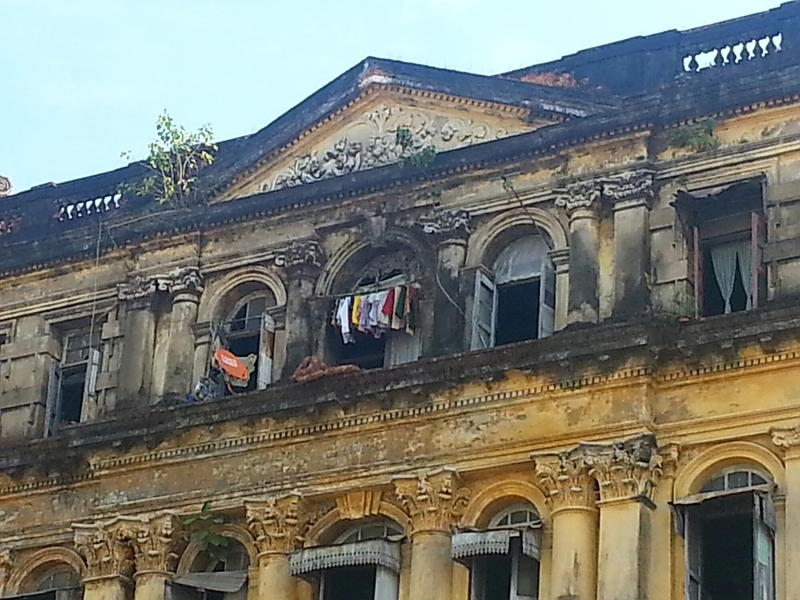 Like other towns and villages I’ve been in Myanmar, there are always beautiful, if not run down, houses. Lunch stop was at Thanaka Garden which had very good reviews at Trip Advisor. 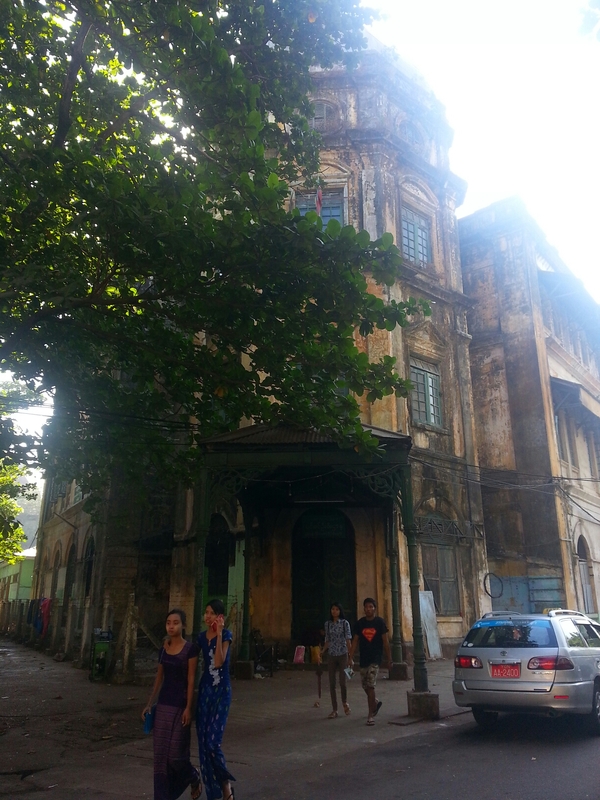 The tranquil setting on a side street coupled with the few people lunching there made me stay a while. Service is very good and the food portions are huge. Appetizer was a plate of fried cracklings. I had a tomato salad which was dressed in a light vinaigrette. I’ve never eaten so many tomatoes in my whole life. These tomatoes, by the way, are brown by the Intha in their floating gardens. My main course was a huge Inle steamed fish which is actually stuffed with some herbs then fried and smothered with vegetables and covered in a sweet-sour sauce. Dessert was a plate of watermelon with some jaggery. It was a good meal though the fish was a bit of a letdown as it wasn’t tasty as I expected it to be. For dinner, I just had two chickpeas crepe I buy from a corner stall. I was taking the night bus so i didn’t want to be too full. 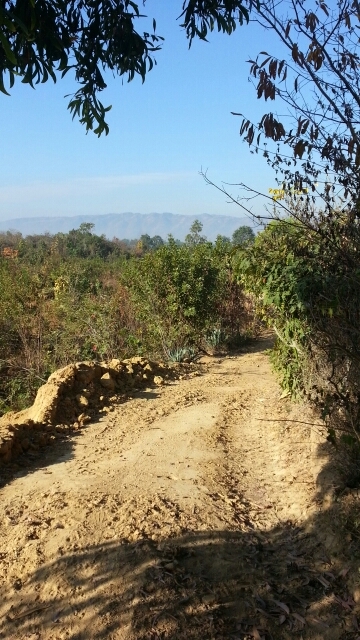 Went on a one-day hike at Nyaungshwe which I booked at Sunny Day Tours. 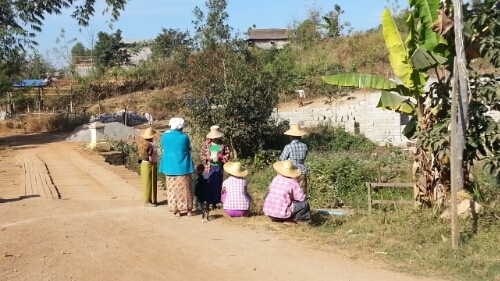 As my Bamar guide told me, a day hike is too short to really visit villages. He was right. There really wasn’t much to see. There were good views but not really something to hike for. 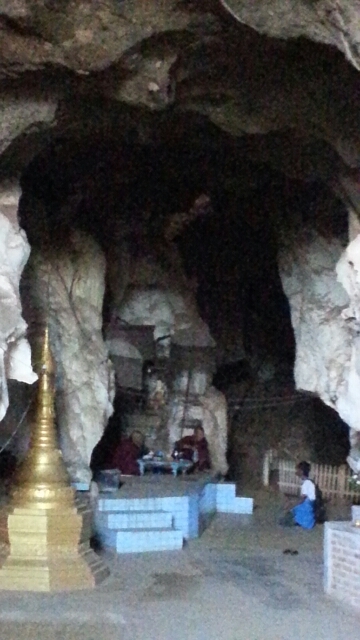 What it lacked in views, however, was somehow compensated by the meditation cave and the school I visited. 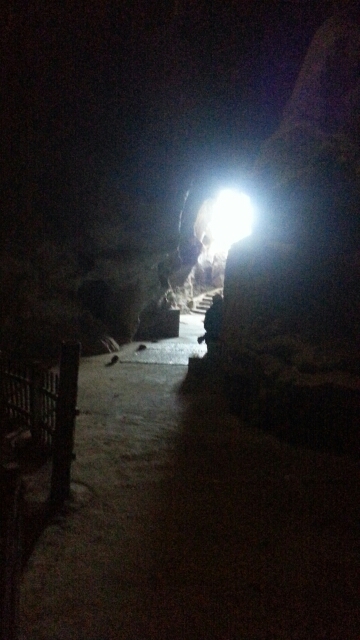 The cave is really nice and you can go to some deeper nooks with a torch. You exit at the orher side where there’s a nice meditation room. Down some steps and back to the village. I visited the school which runs on donations by a Japanese couple. 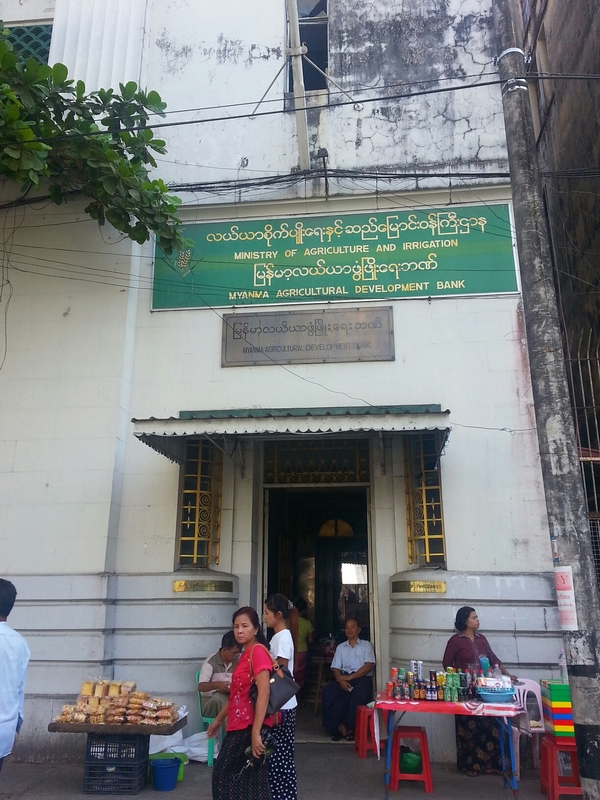 This is the second one I visited in this trip; the first one being in Sagaing. It was fun taking pictures of the kids who got a kick out of seeing themselves on my phone screen. 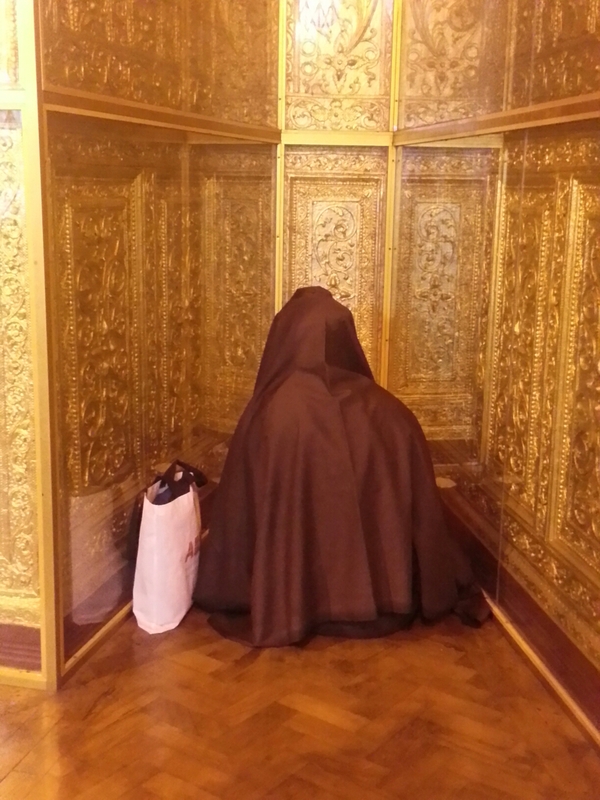 We rested at a shady spot on a monastery.